7:18 AM A hearty "Thank You" to our readers. DBO had 13,460 hits yesterday. Our blog still receives the greatest number of them. In addition, many of you have contributed graciously to the needs in Ethiopia. I will have a full report shortly. These are wonderful blessings from the Lord. Truly, "Every generous act of giving and every perfect gift is from above" (ISV). When I started this article, I expected the Byzantine text to come off as clearly and significantly inferior to the other text-types. I was wrong. While I believe additional tests are needed, I cannot help but suspect that Hort was in error, and the Byzantine text has independent value. This does not make me a believer in Byzantine priority, but I am tempted toward a "Sturzian" position, in which the Byzantine text becomes one of the constellation of text-types which must be examined to understand a reading. 7:06 AM This is about the next best thing to actually visiting the ruins of ancient Corinth yourself. 7:01 AM Students who have asked me about the TNIV will find this essay by Vern Poythress illuminating. It includes a response to Craig Blomberg and Don Carson. 6:58 AM I've just made my reservations for the ETS meeting in Valley Forge this November. I will be staying at the Sheraton in King of Prussia. I would enjoy meeting any DBO readers who might be attending. If you would like to get together, send me an email and we will work out a meeting time and place. 6:47 AM A warm blogosphere welcome to Lee and Dawn Shelton, who have started their family blog. May the Lord Jesus richly bless you and your new child. 6:43 AM We once tried raising sheep here at the farm. Today I prefer reading about them to raising them – especially when the author is so talented. 6:41 AM I agree with das Bibel-Blog that the “Director’s Cut” is preferable to the 100-Minute Bible. No husband is playing his proper role in marriage until he learns to give himself up to his wife, to open his heart to her, to share his emotions and dreams, his thoughts and disappointments, his joys, to fully expose himself to his wife. And there is nothing that makes a woman happier than to know that she fully enters into her husband's life. That fulfills her, and it fulfills him. I am determined to do a better job of this, by God’s grace and in His power. 6:32 AM New Testament Textual Criticism is nothing new. 6:28 AM I’ve got a couple of extra copies of a CD with my colleague Maurice Robinson reading the Greek New Testament. If you are currently studying Greek and would like a gratis copy, let me know. 6:26 AM Personally I like Greek blog titles, but I’m not quite sure what to do with this one. 6:23 AM I happened to be teaching in India when Bombay officially became “Mumbai.” Yet I know of few people today – Indians included – who refer to it by its “proper” name. Here’s an interesting story on the importance of the naming (and renaming) of cities. “Tiberius” in the New Testament also comes to mind. The primary locus for ministry is the congregation in dispersion throughout the community during the week. We have moved the locus to the gathered congregation. 7:43 AM This is just an opinion, but I think Dr. Harry Sturz's name (and bio) could be added to this site. It does include Farstad, after all. I'd even be willing to write the entry. 7:34 AM Over at Ever Vigilant my good friend Lee Shelton takes us on a hard-hitting tour of popular culture and the American Empire and reminds us of some truths the ignorami have made obsolete. I say again: the only authentic response to our political morass is the Lordship of Christ. 7:30 AM Please join us in welcoming 3-day old Harry to Rosewood Farm. 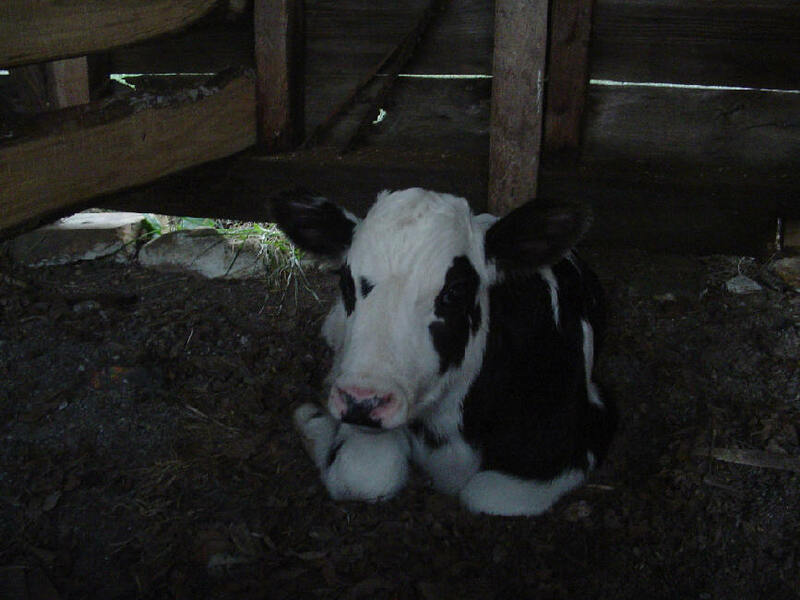 Nathan bought him at a dairy farm down in Carolina. He is being bottle-fed twice daily. 7:26 AM On the question of the legitimacy of using discourse analysis in New Testament studies, Matthew McDill has just posted a response to Robert Thomas. Go here for the .pdf file. I think you'll find Matt's analysis refreshing and illuminating. 7:22 AM We are praising the Lord that Lindsay and her family have returned safely to their home after the hurricane. This is terrific news. 7:20 AM The latest addition to our home page is called Lee's Most Enduring Quality. 7:17 AM At Desiring God, John Piper addresses head-on the question of whether seeker-sensitive preachers minimize the Bible. "Bible," of course, isn't precisely the right word -- after all, it is God who is being minimized. 6:56 AM Over at the Homeschooling Revolution Izzy tips us to a piece on the horrors of children riding school buses. If people want to remain blissfully ignorant of the dangers of our government schooling system they have that right, but if they're unable or unwilling to confront the evidence I wish they'd spare serious folk all the teary-eyed sentimentalism. There's a better way, and if, say, a single mom wanted to raise her own children at home (and teach them also) our churches should stand behind them 1000 percent, and that includes financially. No Paid Full-Time Staff - We certainly believe there is freedom to have paid staff and biblical examples of the same (1 Tim 5:17-18). We have found that some modern churches elevate paid staff (which is not required by Scripture) as a priority over other commands of Scripture (such as caring for the fatherless & widows). Some modern churches tend to rely too heavily on paid staff to provide spiritual food to families rather than expecting men to both lead their families and participate in corporate praise & worship. 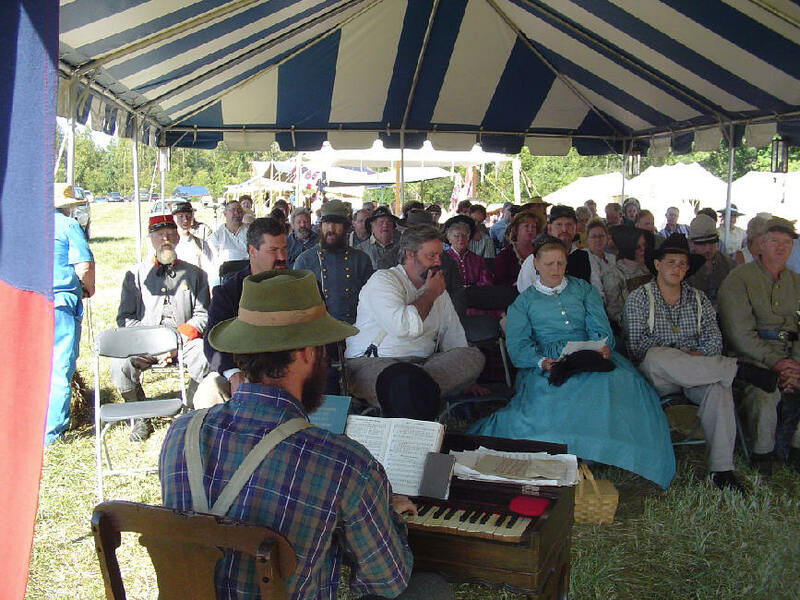 Therefore we will refrain from paying elders or administrative staff for anything other than reimbursement of legitimate expenses and small stipends until we have firmly established the opposite patterns (caring well for fatherless and widows and men actively participating in corporate praise and worship). 6:20 AM I see the Friedrichs have been enjoying the free entertainment put on by nature. I can remember growing up in Hawaii. I can say that there was never a time when I was not consciously aware of the beauty of nature -- Kailua Beach, the Pali mountains, the afternoon rain, the windward breeze. Here's a sampler (this is also my screensaver on my home computer): sunrise over Lanikai and the Twin Islands. These days I find my animals sufficiently entertaining that I haven't watched TV in years. As one writer to DBO once put it, there's a reason TV Guide calls it "programming." 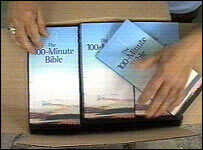 6:16 AM This may disgust you but I bet it won't surprise you: The 100-Minute Bible. 6:14 AM The Gospel according to Warren. 6:12 AM The journal Novum Testamentum just published my review of N. Young's Syntax Lists for Students of New Testament Greek (Cambridge: CUP, 2001). 6:10 AM It hardly seems possible that it was 6 months ago that I had to put down my favorite horse. Strange, hardly a day goes by when I do not think of him, even though I enjoy riding Traveler, my Thoroughbred. Cody will always have a special place in my heart as my first horse. Here he is about to give a ride to one of our many guests at Bradford Hall. He always seemed to know who was on his back -- whether experienced or inexperienced -- and would handle himself accordingly. Today it's just me and Trav, whom I ride every chance I get. Trav is our lean, mean running machine. He knows just one speed, which happens to be my favorite also. 6:06 AM I am never surprised to read about the moral bankruptcy of our universities -- the most closed-minded and politically-correct places in the nation according to Allan Bloom. There are, of course, exceptions, but their appearance occurs so infrequently that they do nothing more than draw attention to the rule. In his latest essay at the Chalcedon Foundation Lee Duigon does a good job of exposing the degree to which the academic community tilts to the left. I found this to be true even in the refreshingly "liberal" atmosphere (I use the term in its original, positive sense) of the University of Basel in Switzerland, though even there all the teachers in the Practical Theology Department were avowed Marxists. Thankfully, in the Theology Department they were open to Bible-believing Christians -- as long as they could write a defensible dissertation. 6:00 AM When I arrived home last evening my son met me with a wonderful surprise. He had fallen a HUGE pine tree and was barely able to haul it off in four giant pieces to the local sawmill. While there he was able to swap our monster pine for about 10 extra wide pieces of the most beautiful oak you have ever seen -- perfect for furniture. It took us a long time to move all the pieces into one of our barns, but this wood is a treasure trove. Its ours because of the entrepreneurial spirit of Nate. 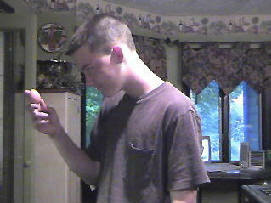 Currently I'm working up a web page for Nathan's work. 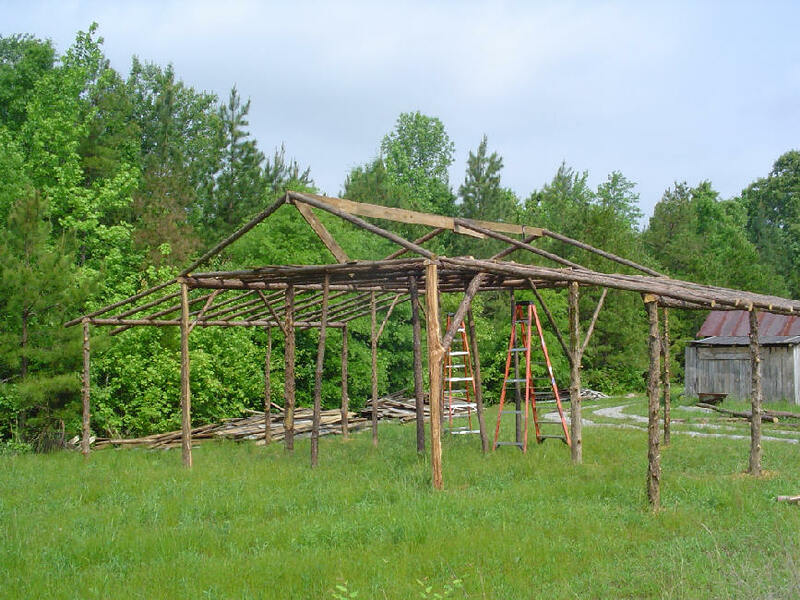 In addition to managing a 123-acre farm, he specializes in wood working, organ restoration, furniture making, interior remodeling, and restoring old homes. 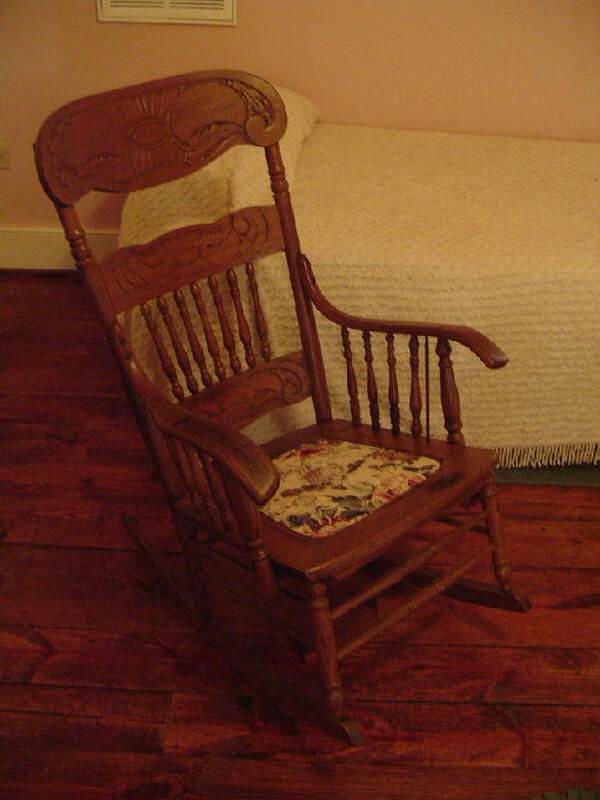 Here are a few samplers of his work, beginning with an old chair he restored. 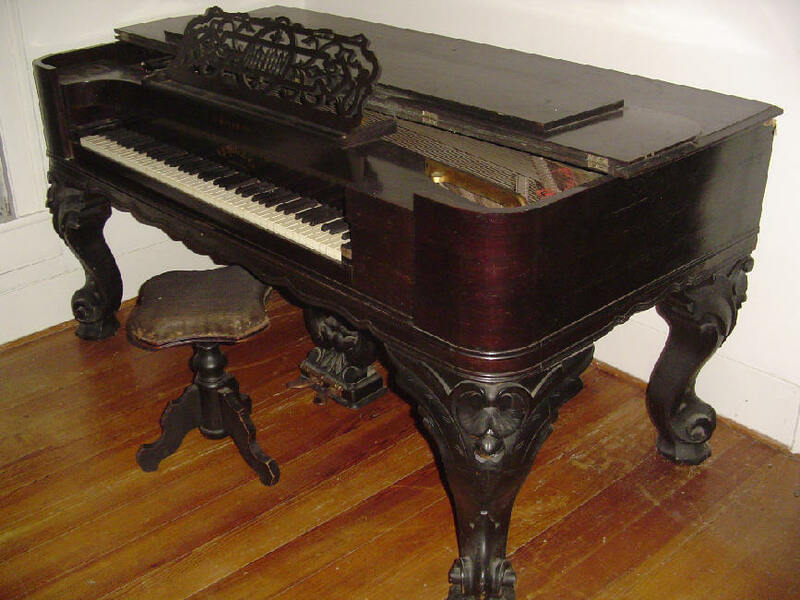 He is almost finished repairing this beautiful piano we bought at auction a few years ago in Oxford, NC. 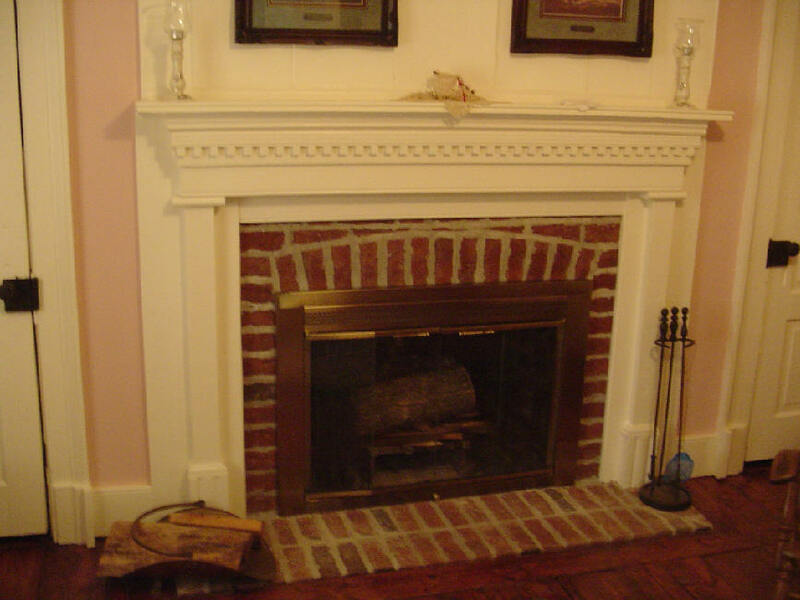 And this is one of 5 fire place mantles he built for us here at Bradford Hall. I love the dental molding. We call this guest room the "Rose Room." Much of the wood and all of the doors date back to the ante-bellum period. Though I am a willing helper, Nathan did not get his abilities from his dad, who can't even change a light bulb without explicit instructions. 6:27 AM I suppose I can consider myself a card-carrying member of the New Testament scholarly guild yet I hold to the authenticity of the last twelve verses of Mark. What, then, am I to make of statements like this? And of course, no textual scholar worth his or her muster believes these verses were original. 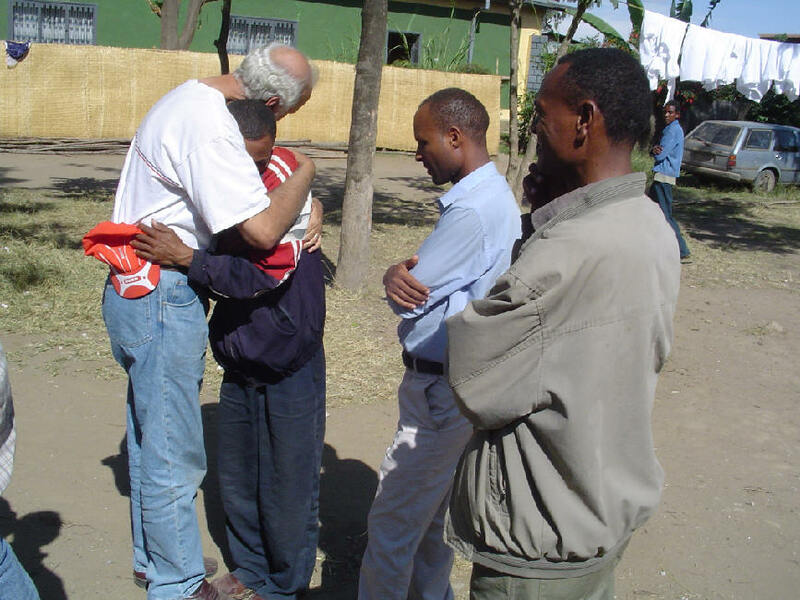 6:23 AM John Frame on a problem the Ethiopian church faces daily. The Scriptures are much too clear on this. Until shown otherwise on the basis of Scripture, I am convinced that Christian baptism is for believer's alone, and no Presbyterian that I know would regard me, on this basis, to be weak in faith; they would, however, regard me as holding a false belief. They will have to work hard at convincing me that they are right and that I am wrong. 6:16 AM Could this happen here? Now these early assumptions are being sharply revised. Under an authoritarian government determined to control information, China has grown a new version of the Internet. As former US President Bill Clinton noted recently, China's Internet is very unlike the cauldron of dissenting voices that is the hallmark of the Internet familiar to Americans. Instead, it's heavily filtered, monitored, censored, and most of all, focused on making money. 6:12 AM I once heard Hans Kung speak in Basel, much to the dismay of the Roman Catholic hierarchy. But Basel has always been known for its tolerance of dissenters. Even a guy from a no-name school like Talbot Seminary could get a doctorate there, you know. But challenging papal infallibility is going too far! 6:10 AM A warm welcome and shout out to Karl Hoffman and family who have begun a blog. Karl is a former student of mine who excelled (among other things) in his Greek studies. To read his church website, click here. If you love church buildings, don't click here. Congratulations, Karl! You were missed! I was glad to hear it was just a modem problem and not an illness or some other problem. Have a wonderful week. God bless. J. W.
6:06 AM The good folks at the American View website are really showing their stuff in the wake of the Sandra Day O'Conner retirement. Here's a powerful piece by the one-and-only John Lofton. 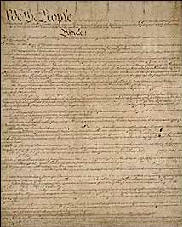 Reading it through my constitutional lens, I conclude that the establishment could care less about the document that matters so much to John and me -- that scrap of paper called the United States Constitution. I fear the policies attributed to Ms. O'Conner have, in fact, an intellectual basis -- one that's deadly for our Republic. 6:04 AM The Online Parallel Bible is up and running. 6:00 AM If you ever get to London, a trip to the British Museum is a must. Here's one reason why. Here's a shot I took today of our Sheltie Sheba when I went out to check on the animals. 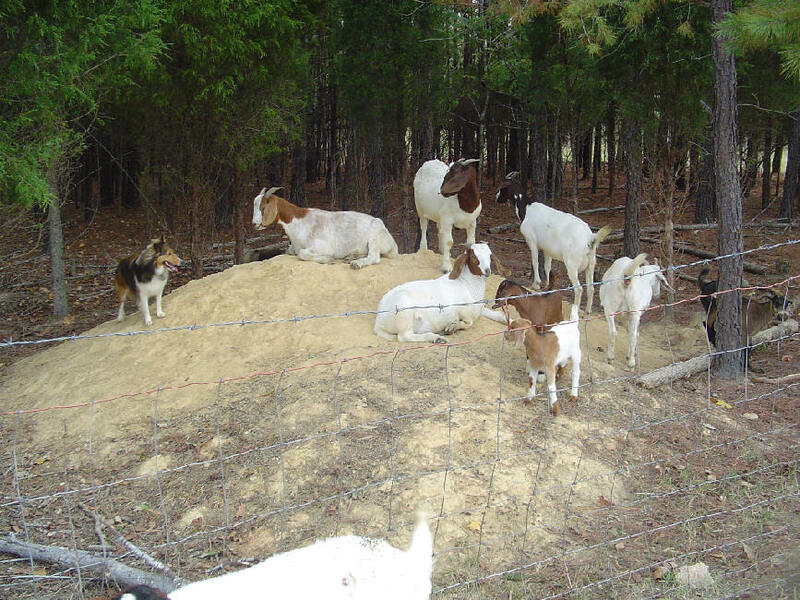 She is doing what she does best: standing guard over the goats. By the way, she is coming into heat (much to the interest of Mr. Shiloh) so we may be having little Shebas in a couple of months. I'm off to get rid of stones in our new pasture then help my son seed. I hope to get in a ride today before the rain. Buddy is doing a great job of calling our statesgods to account. The link above will take you to his website. 8:12 AM America's warfare/welfare state represents human hubris at its "best," so I'm not surprised to see this post by Chip Bayer about Nazi Germany's crusade during WW II, claiming, of course, the blessing of the Almighty. 7:59 AM Update on Bereket: Our Ethiopian son Bereket continues to improve. He has met twice with his surgeon after his cornea transplant. His vision is gradually improving but he must remain in the capital for several more weeks as they monitor his condition. Spiritually he is growing like a newborn baby, hungering and thirsting after the pure milk of the Word of God. Even through suffering, God is accomplishing His purposes. 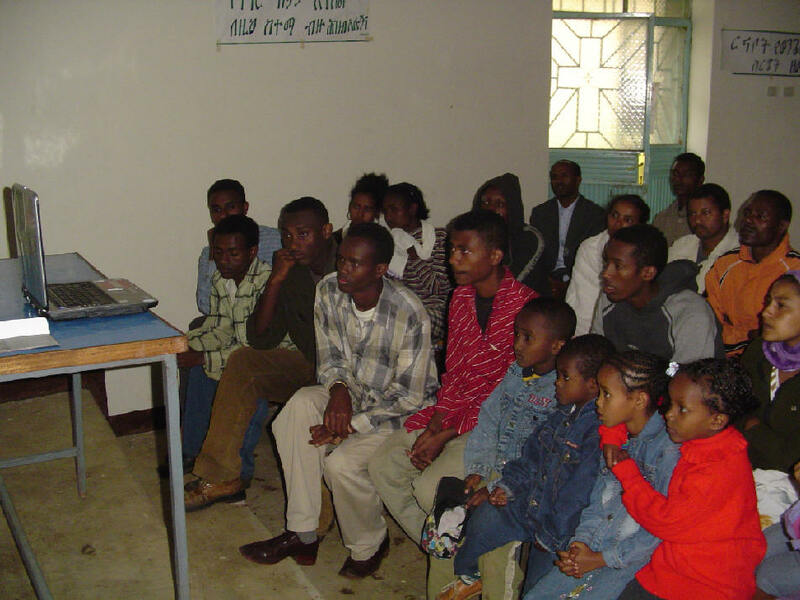 Bereket is making it possible for God to reveal His sovereignty and healing power. He is transforming brother Bereket into a witness to Jesus' deity, just as in John 9. God continues to work out His good purposes through our fallen world. To Him be all the praise and glory. 7:50 AM The last thing Ethiopia needs is another war with Eritrea, its neighbor to the north. Please join me in praying for peace in the Horn of Africa. In Germany, persecution means fathers and mothers jailed for trying to homeschool their children, Christian children taken into custody by the state and placed in orphanages, and government officials telling “fundamentalists” to get out of Germany. It is significant that our "allies" in France and Austria aren't too thrilled about helping home scholars either. 7:42 AM Now this is a first. A professor at one of my sister seminaries has notified me that he has requested the publisher of my book It's Still Greek to Me to send him the electronic files so that he can convert the book into Braille for a blind student. Marvelous! 7:38 AM In an update at the Faith and Dominion site, our friend Stiles Watson writes about the history of the term "New World Order." His reference to Winston Churchill is worth a link by itself. 7:29 AM You shouldn't miss Lost In Grace's post on Calvinism and evangelism. 7:25 AM I think I may have just found my Internet twin. 7:20 AM At the Parenting with Purpose website, Mrs. Julie Austin has posted a wonderful essay about my wife Becky Lynn. Thank you, Julie. Your family is very special to all of us here at Bradford Hall. 7:18 AM The latest addition to our home page is called Election 2008. 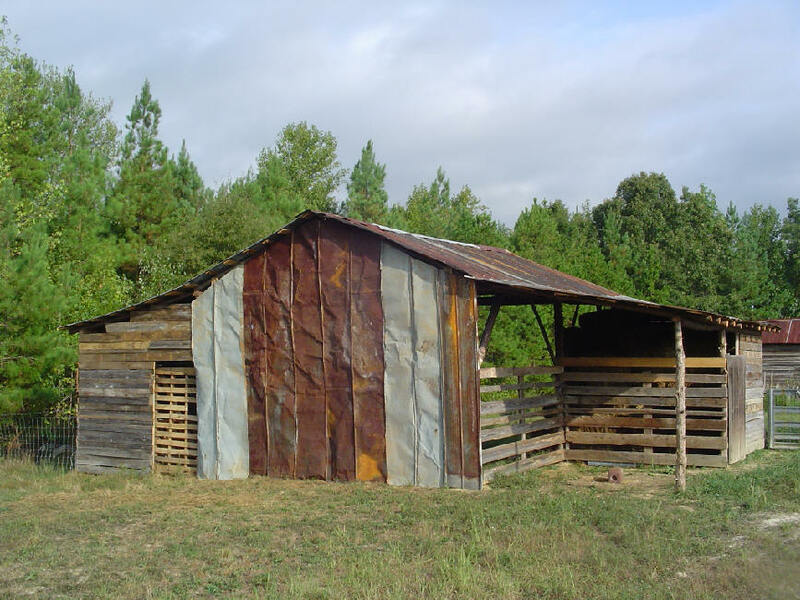 7:12 AM I'm leading off today's blog update with a Monday morning shout out to our friends at Norlina Baptist Church in Warren County, NC, where I preached a revival all last week. Pastor Doug is a former student of mine and he and his wife Janie are doing a great job loving and leading their people. I spoke on Jesus and the Age 12 and Age 30 Transitions and the horrors of adolescentism, but the real blessing was the high level of participation among their youth in the services. This week is already shaping up to be a busy one. We are going to try to finish clearing our new hayfield (about 5 acres) today and have already begun sewing seed for grass. We are hoping for rain here in the Virginia Piedmont, which would be most welcome. This week I must also make my reservations for the ETS meeting in November at Valley Forge and purchase my plane tickets to Philly. This year I will be rooming with a good friend from Lancaster Bible College in Pennsylvania whom I got to know while doing some teaching at Grace Seminary, Richard Fairman. 6:38 PM We're back. Our modem died on Wednesday and we just replaced it. Updates shortly. It may take me a few days before I can respond to your emails. 6:59 AM My wife's sister is a professional signer, and I've had some interesting conversations with her about the signs for this or that theological concept. Now Wycliffe is going to invest in a major project to bring the Scriptures to the deaf. 6:55 AM I have yet to visit China though I have taught in Korea on several occasions. Here's an interesting report on the effect of China's one-child policy after 25 years. It is possible that this intrusive government policy might be relaxed. 6:52 AM I haven't mentioned this in a while, but an excellent list of online biblical scholars may be found here. Thank you again, Angus, for providing this service. 6:50 AM While teaching at Norlina Baptist Church this week I mentioned Sepphoris, Herod's capital city located just a few miles north of Nazareth. It was here that Jesus and His brothers and father possibly worked as builders. Many asked for more information about this city, now excavated, and here's as good a place to start as any. Another resource is the book by Richard Batey called Jesus and the Forgotten City. Batey may have overstated his case, but if so, not by much. 6:45 AM I note with interest that Mark Goodacre is moving to Durham to teach in the Duke religion department. Dr. Goodacre is the author of The Case Against Q and other significant works on the synoptic problem, and I look forward to interacting with him in future on this topic. Perhaps it is time to have another symposium on our campus like the one we had in 2000, which resulted in this book. At any rate, a hearty welcome to the Tarheel State, Mark, and all best wishes in your new post. 6:40 AM I am looking forward to teaching an elective on New Testament Textual Criticism next spring. Meanwhile, here's an exhaustive list of NT manuscripts to keep all of us busy (kepi tip: David Ritsema). Go here for more on the infamous Colditz Castle. The resilient and indomitable spirit of POWs during the Second World War is almost beyond belief. 8:17 AM The latest essay on our home page is called Patrick Henry Was Right. 8:11 AM The Society of Biblical Literature 2005 Annual Meeting program is now online. I live in a humanist, secular society that supports vast state-to-state foreign aid programs through compulsory wealth distribution. All this I oppose, for God’s word is clear that the family – and not government – is the primary agency of welfare, and the church has social obligations as well. Ws stand condemned in America for building great sanctuaries while failing to minister to the poor all around us. It is the church, not the civil government, which should provide for charity. Nowhere in the Scriptures can I find evidence that the state should undertake such charitable works. I also live in a land of great wealth and unbridled hedonism. Have I escaped the snare of profligate consumerism? This is a question I ask myself often. The answer is to be found in one word: stewardship – the responsibility that each of us has to tend the garden God has given us. The New Testament teaching on this subject has helped me to understand my responsibility before God and the world. God has blessed me with the strength, abilities, and circumstances to earn an income. Whatever I have is not based on whether or not I deserved it. I am challenged in this age of hedonism to live within my means – to live a “lifestyle of enough,” as someone once put it. I must act as a steward instead of as an owner. I must view my wealth as a gift to be received with gratitude and a responsibility to be exercised humbly. “Do not lay up for yourselves treasures on earth,” said the Master (Matt. 6:19). His command stands in clear contradiction to the egoism, materialism, and greed of the Western church. Material blessings are not wrong in and of themselves. The point of Jesus’ warning is that it is wrong to lay up treasures for yourselves. This means, for example, that while Becky and I have legal “title” to our farm, we don’t “own” it. We are but stewards on behalf of the real Owner. In recent years the Lord Jesus has led our family to place a high priority on sharing what we have with others through opening our home and through our financial support of various causes and individuals throughout the world. God has not called us to be poor, but He has called us to identify with the poor and, whenever possible, to provide for them. More than ever, we are realizing that the kingdom Jesus promised us is an alien kingdom – a kingdom “not of this world.” We are but aliens and strangers on earth who long for a better country. Jesus said, “A man’s life does not consist in the abundance of his possessions” (Luke 12:15). Paul added that while money is not evil, “the love of money a root of all sorts of evil” (1 Tim. 6:10). Our economic lives (not just our savings and investments but our possessions as well) must come under His kingdom dominion if we are to be His followers. 8:53 AM Now here's a guy who's excited about Greek. 8:47 AM This post is just a long aside, but I can't imagine a pastor or church leader not having a blog. 25 percent of Internet users read blogs daily, and that number is growing. If I've got something to say it may take years (literally) for my thoughts to get published in a journal article. The same message will have been read by a good many persons the very next day if I blog it. I used to write several journal articles a year but have since focused on blogging and writing essays for my site. I'm not saying that journals are a thing of the past; after all, I serve as an editor of Filologia Neotestamentaria in Cordova, Spain. But the longer I am in ministry, the more important it is to me to share what the Lord is doing in my life, and blogging is no doubt the quickest, easiest, and least expensive way to do that. 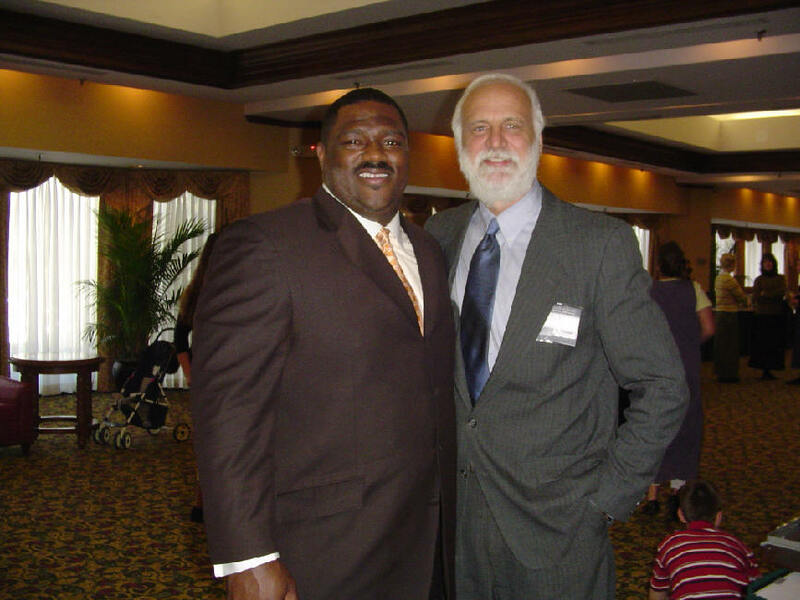 8:40 AM Big Sunday shout out to my good friend Voddie Baucham, "youth ministry specialist" (a little inside joke). Love ya, man! 8:35 AM "It's called commitment": My son posted this on another blog and I thought it was so good I'm reposting it here. Last year at our local Associational meeting (Southern Baptist) we recognized a local pastor who has been at the same church for 50 years. And that church was a small (30) membership rural church. He stood and told those gathered there that the reason he had such success was that when he went there, he chose to become a part of that community and do his share. For the first 20 years he had a full time job in addition to his pastoring, before he became a full time paid pastor. Today’s pastors need to sink their roots into a community, and then the ministry opportunities will come as the Lord opens doors. Pastors today know that they have a job, and therefore are unwilling to invest their lives into that community. The people know that the pastor will only be there for a few years and don’t have the desire to build relationships with someone who is willing to leave when the pasture dries up. The church is a community, and the pastors ought to be a part of that community (which means they should have grown up there as well, preferably). That is the only way that pastors will stay; when their lives are completely devoted to the people there. It’s called commitment. 8:25 AM So you want a domain name in Greek? 7:53 AM Rick Brannan compares the Complutensian Polyglot with the Erasmus Greek New Testament in this interesting blog post. The famous "Heavenly Witnesses" passage in 1 John 5:7-8 is also briefly discussed. Kudos, Rick, for some awesome graphics. 7:50 AM Metzger's Textual Commentary on the Greek New Testament can now be accessed online. This is an indispensable resource for all Greek students. 7:45 AM I don't know how I missed this discussion by Wayne Lehman about Bible versions, including the one I had the privilege of working on. Thank you, Wayne, and keep up the good work at the Better Bibles Blog. 7:38 AM The latest project here at Rosewood Farm is clearing land for a new pasture and for a small log cabin. 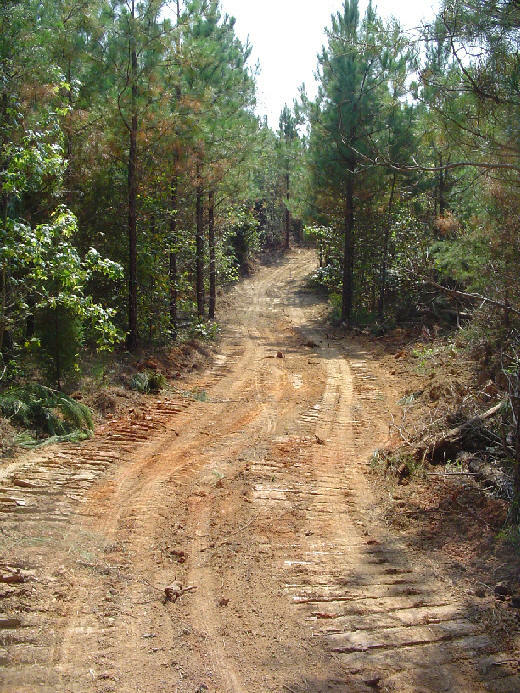 Here's the road leading to the clearing. 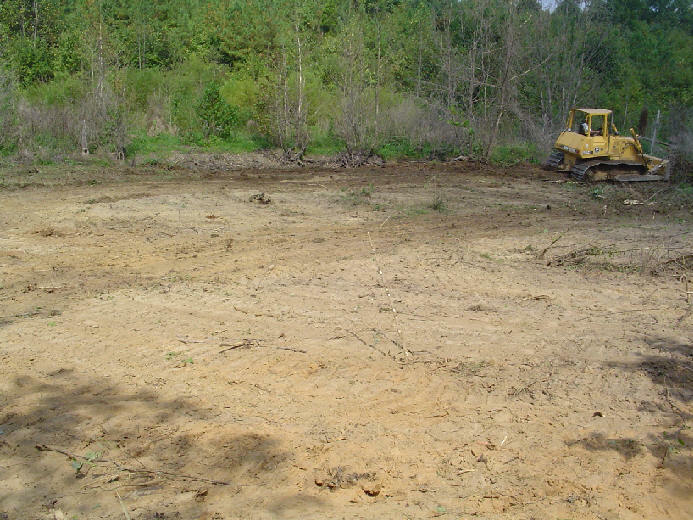 We'll clear about three acres, pack it down, then seed it with alfalfa, red clover, orchard grass, and crown vetch. We are very grateful: The day before yesterday the Lord sent us a bit of rain -- just enough to keep the dust down. Oh, and here's Frank, who greets me in the morning just in front of our front porch. 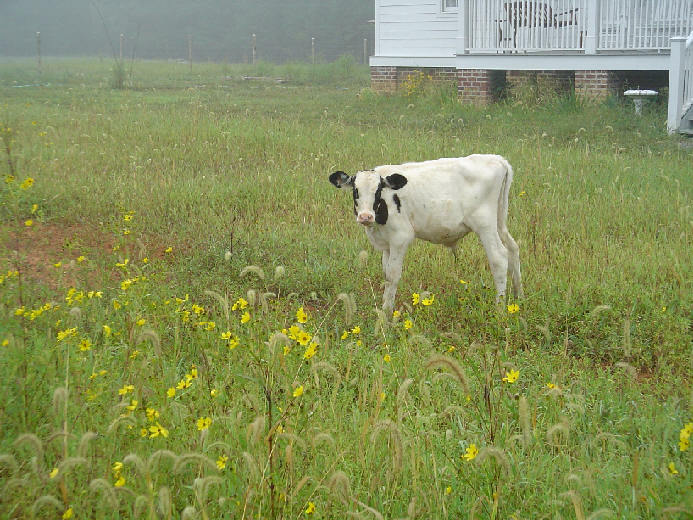 There is no more pastoral scene, I think, than cattle grazing in a field. Prayer is far more than uttering words. I can pray when I do not think I am praying. We can pray without any words at all. Prayer, in the last analysis, is the urge of the life towards God, and spiritual things; the setting of the mind upon things above, as Paul has it. Every detail of every day can be mastered by that urge. 7:20 AM This site brings together various bloggers who are associated with Southern Seminary in Louisville, KY.
7:12 AM Curious about the history of Greek? 7:10 AM This year's Evangelical Theological Society meeting in Valley Forge ought to be interesting. There's a great need to clarify what "inerrancy" means, and this is the year to do it. If you would like more information, this essay will bring you up to speed. As an aside, I note that Bible Works will offer training to language profs during the conference. 7:08 AM On this Constitution Day I want to thank King Jesus for the nation He raised up and confess that He is still Lord, God, and our only hope of salvation. Like every nation, America is faced with a choice. We can either love and respect God's Anointed and so experience His mercy and blessing, or we can refuse to submit and incur His wrath. 7:05 AM Tom Ascol says the pastor ought to be a theologian. I concur. Several of my Ph.D. students are, in fact, planning on a lifetime of pastoral ministry. I praise God for every one of them. 7:00 AM James Spurgeon has posted a great blog entry about cults, their leaders, and what happens to those who try to escape from their influence. 12:38 PM Tomorrow is Constitution Day. In honor of this occasion I offer several essays on my home page for your weekend reading. 11:48 AM Jeff Wright has an outstanding post on why pastors are leaving their churches. I plan on addressing this issue during my revivals this year. The thesis for the book is that the church should be built around the Gospel. Every aspect of “doing church” should have as its primary focus, the Gospel of Jesus Christ. From the children’s Sunday school to the announcements, to the pastoral prayer, to the songs selected to sing and the sermon, every act should point to the One for which we gather. Would anybody out there like to tackle the Scripture-Driven Church and ask some hard questions, such as where is the "Sunday School" in the New Testament (this goes to the heart of the age-segregated philosophy) or the pastoral prayer, for that matter? 11:35 AM Is DBO a biblioblog? Yes and No. The answer is No if you are looking for a continuous platter of essays on the New Testament or Greek. Life is simply too varied for that. But the answer is Yes if you believe that all of life -- missions trips, marriage, even managing a farm -- is integrated with one's understanding of the Scriptures. Maybe we could settle for "bioblog"? 11:27 AM This Sunday I'll be speaking in the big city of Norlina, NC (pop. 1107). As you can tell, I like "big" cities. Looking forward to it, brother Doug! 10:58 AM Have I mentioned this helpful link to New Testament Greek resources? 10:55 AM Just noticed that Dallas Seminary is offering a nice discount on my beginning grammar. An even better bargain can be found here. 10:45 AM Etymologizing is alive and well. Just ask T. D. Jakes. 10:43 AM Several bloggers have recently called attention to this tool with which to supplement Technorati. I like what I see. 7:59 AM Who said it? It is not the critic who counts; not the man who points out how the strong man stumbled, or where the doer of deeds could have done better. The credit belongs to the man who is actually in the arena; whose face is marred by dust and sweat and blood; who strives valiantly; who errs and comes up again and again. 7:55 AM Just met my first couple from New Orleans Seminary who are enrolling at SEBTS on a temporary basis. I wish them well. 7:23 AM On Wednesday, President Bush took responsibility for the failures of the federal government's response to Hurricane Katrina. Bush also sacked the head of FEMA. I applaud the president. 7:17 AM Now this is cool. Thanks, Jonathan. 7:15 AM The Guardian notes how satellites will help relief workers during future disasters. 7:12 AM OK, Carmon, it's time for me to cough up my two cents. 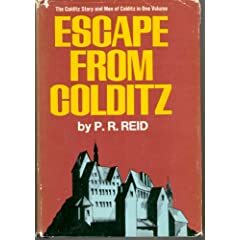 My favorite escape books are just that: Escape tomes that describe real getaways from German POW camps during the Second World War. In fact, I just bid on (and won) my first product on EBay -- the Wooden Horse video, which recounts what has got to be the most remarkable escape that took place during the war. 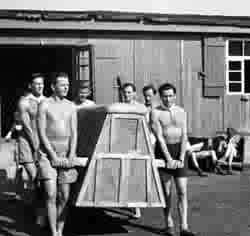 In the summer of 1943, Eric Williams began to dig a tunnel at Stalag Luft 3. 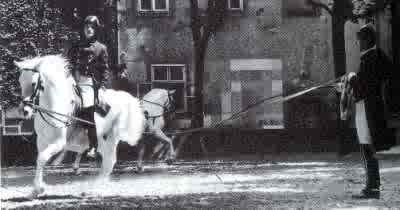 Every day a wooden vaulting horse was carried out to the same spot around 30 metres from the warning wire. While their fellow prisoners exercised, Williams and two accomplices, Michael Codner and Oliver Philpot, dug from a trap door hidden beneath it. After 114 days of work, the three men escaped and eventually reached Britain. I have read the book many times and will now get to see the movie for the first time. On Biblaridion, Bryan mentions Dave Black Online, a site I have visited before but tend to forget to go back to because of its lack of RSS feed. But it's nice to see a "Happy blogiversary" to me a couple of weeks ago (no permalink), especially as I'll be headed in that direction (North Carolina) before long. So any chance of an RSS feed, Dave, and then I can read your blog every day, and add it to my blogroll? I must be way behind in my cybernetics. I thought other people simply did what I do every morning: I go to my "Favorites" and click on my, well, favorite blogs. Some of them I check every day (you good folk know who you are); others might get a look-see on a weekly or monthly basis. 7:03 AM I was reflecting on my recent posts on my Civil War (read: Confederate) heroes and musing why so many of my readers have responded so favorably to them. The average American has an abysmal understanding of the war at best, though many (like yours truly) have fallen down the C. W. History Hole, never to be able to climb out again. As a wee little boy playing war in the sands of Hawaii's beaches with my friends, I well recall playing the boy in gray when all my pals wanted to be on the right (read: winning) side. Later a new equilibrium kicked in after I began to actually read the founding documents of our nation, including the all-but-forgotten Constitution and Bill of Rights. I've said it before; I'm saying it again: before one expresses an opinion about the Constitution one would do well to read it. And now, after years of pledging allegiance, the line between patriotism and nationalism has become so blurred as to be almost nonexistent. Anyone who questions the actions of the state is labeled “unpatriotic.” Even more egregious, Christians have come to regard this new “patriotism” and their faith in Christ as intertwined. Being a good Christian has become just one aspect of being a “patriot” and pledging allegiance to the flag, at the very least, brings with it an implied acceptance of anything the state does. After all, we’ve sworn allegiance to that state. It is known as civil religion. By the way, Samuel Johnson once defined patriotism as the last refuge of a scoundrel. I would say if he means true patriotism, I must disagree; but if he means Americanism or nationalism he is spot on. UPDATE: My good friend Lee Shelton adds some pertinent thoughts about how our "war on terror" appeals to a misguided sense of patriotism. 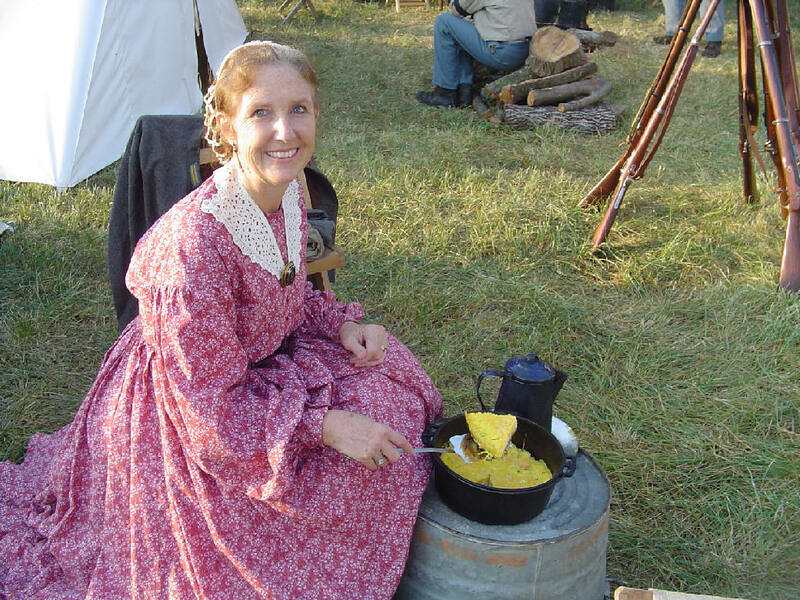 6:58 AM All this week Becky has been cooking for me my favorite meals to celebrate our anniversary, beginning with a cheese omelet prepared over an open fire at the Zachary Farm reenactment (see below), and followed by such meals as spaghetti and stuffed peppers. I can't wait to find out what she is preparing for tonight's supper. I wanted to send you an email to let you know how much I enjoy your blog. I especially enjoyed your article this morning on Stonewall Jackson. 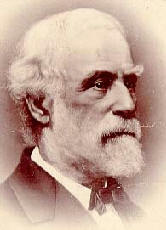 When I was in High School (home school) I did a unit study on the life of Thomas Jackson and as a result I have a passion for all things related to him and the War of Northern Aggression. I enjoy very much your insight and commentary on such things. May God richly bless you and Mrs. Black as you pursue your ministry. Keep it up!! 6:43 AM Wish I were here this week. Dressage means the schooling of the horse and it results in the kind of beauty and poise one thinks of when one watches ballet or gymnastics. It is the backbone of all equestrian science. My dressage instructor in California was a German who taught me many practical skills about the art and science of riding that I in turn passed on to my faithful horses at home. 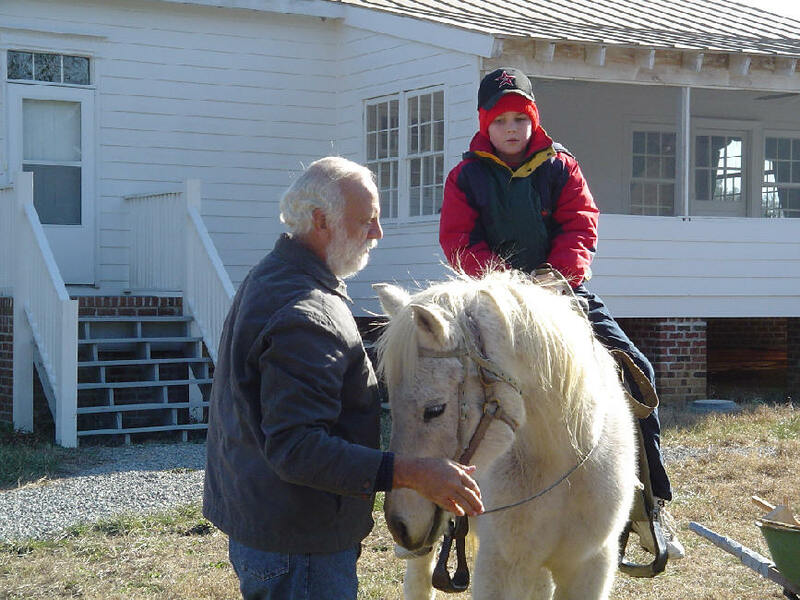 It was especially important to learn to ride without one's stirrups in order to gain the correct seat. The Spanish Riding School of Vienna is world famous for its master horsemen whom I have always tried to emulate. These inescapable facts cropping out of America’s political and moral landscape—the total capitulation of the Democratic Party and the creeping capitulation of the Republican Party to the culture of death—are the main reasons I now call myself an Independent. I cannot be party to the parties of national moral suicide. 6:37 AM Here’s a neat glossary of linguistic terms. At the same time, it’s pretty clear to me that someone needs to standardize the nomenclature used by biblical linguists. Ph.D. dissertation, anyone? 6:30 AM Kittel’s Theological Dictionary of the New Testament is now online. 6:58 AM The latest addition to our home page is called The Tenacity of a Stonewall. 6:50 AM The abandonment of a work ethic is a catastrophe far worse than the effects of any pandemic. 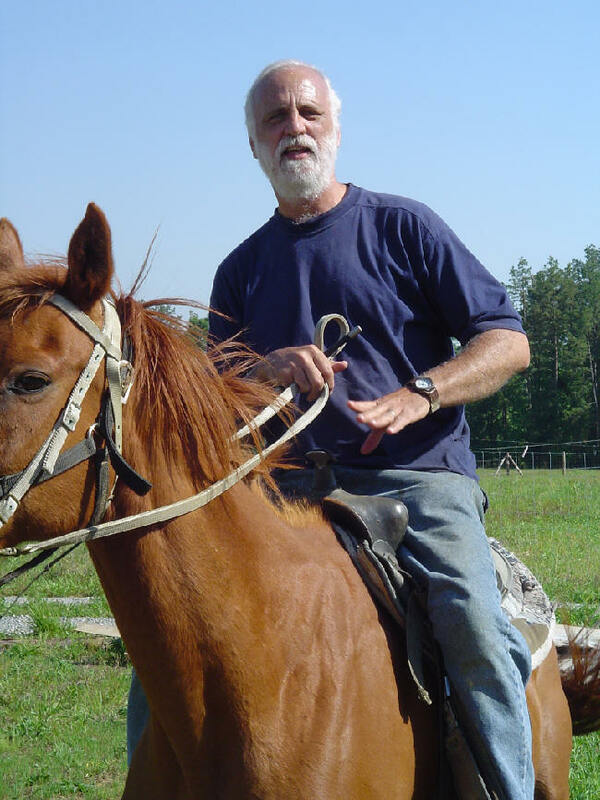 Here's an especially bright nugget on the joys of working from one of my all-time favorite Baptists -- and a former chaplain in the Army of Northern Virginia to boot. 6:45 AM My good friend John Leone, constitutionalist and New Jersey cop, now has a blog. He offers some political analysis that I think you'll find interesting whether or not you agree with all of it. 6:42 AM Those impatient for analysis of problematic texts regarding the role of women in church should do their own research. Meanwhile, here's a good summary by Matthew McDill to get you started. 6:35 AM Our son donated this old reed organ to a fellowship of believers that meets in a barn. He completely restored it and it is now in perfect working condition. at Rosewood Farm. Students, please mark your calendars now for Saturday, October 15, 11:00 -5:00, lunch at 12:00 noon. Spouses and children are welcome. More details soon. 6:35 AM Jon Luker is blogging again over at Polemics. Much of what Jon says is intuitive and hardly polemical at all. I hope his site attracts a good deal of attention. 6:32 AM Yet our current federal government spends billions of our dollars on things like Medicare, Medicaid, welfare, Social Security and the like at a huge cost to the American taxpayer. The virtue of any of these programs is not at issue here. The only issue is that Congress, according to the Constitution, has no authority to do these things. The legacy of political liberty, as won by our founders, is all but gone. Fortunately for us, they left us another legacy. Read more. My Dear Dr. Black. I very much enjoyed your dissertation about General Lee's height and stature. 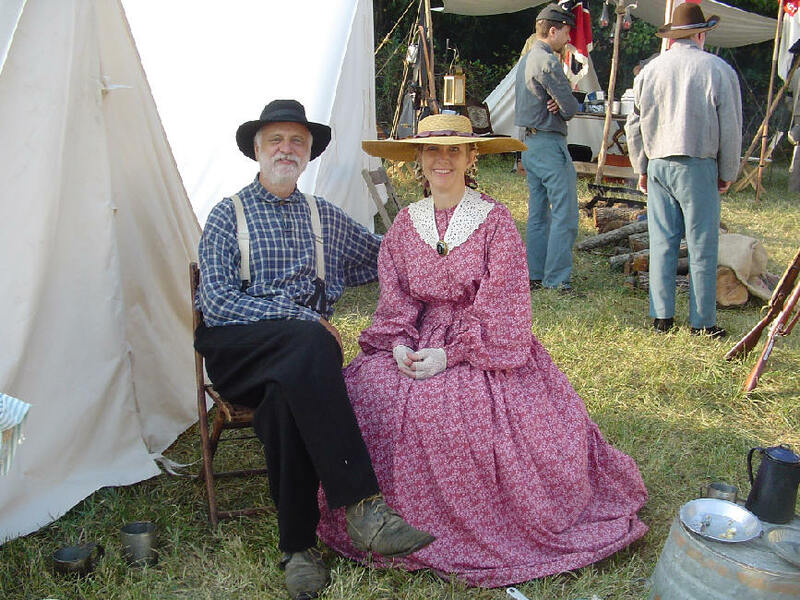 One of the more common questions I am asked as I portray Robert E. Lee is, "Aren't you too tall for General Lee?" To which I reply, "No, Martin Sheen and Robert Duvall are too short". Your writing about the character and Christianity of General Lee are well taken and most accurate. I am 6'2" tall and given the larger stature of today's people, I give a similar experience to meeting the original General. But as a friend teased me, "Don't worry, you'll grow into the part". I sincerely wish that more people would read your words. Thank you. I remain your most respectful servant, D. C.
8:27 AM Peter Head makes some interesting observations on singular readings in manuscripts of the Greek New Testament. I have a special interest in this subject since my own view would necessarily rule out singular readings as potentially original readings. 8:23 AM Here's a site that features a nifty virtual tour of Jerusalem. 3000 Americans died on September 11, 2001 by the hands of foreign terrorists to which our nation rightly mourns. Unfortunately, few Americans realize that on the very next day (and everyday since) September 12, 2001 another four thousand Americans died at the hands of domestic terrorists (abortionists) and few if any noticed. Sadly, for these victims of terror there is no day of remembrance. This is an issue that all principled Christians should expect to hear often; and Mark illuminates a context for our answer. You can read the entire article here. 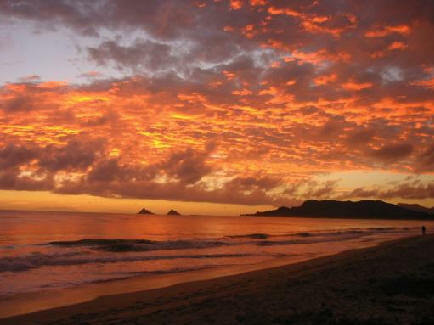 7:49 AM I well recall my baptism at Kailua Beach in a public setting in 1960. Later our church built a baptistry. I thought, "Why would any church in Hawaii need a baptistry?" Apparently the baptistry controversy has not gone away. In the New Testament, baptism was considered the public profession of one's faith in Jesus Christ -- not walking an aisle, or signing a pledge card, or praying a prayer. How easy it would be restore that today if we were willing to give up some of our ephemeral comforts. 7:23 AM Monday morning shout-out to Al Boswell and his team for putting on a superb event this weekend at Zachary Farm in Alamance County, NC. It was one of the best reenactments I have ever participated in. Here's my beautiful Southern belle in the dress she sewed for the event. On Sunday morning, our anniversary, she pampered me with coffee in bed (well, in the tent at least). Much to the delight of all, Nathan playing his reed organ during our period worship service. 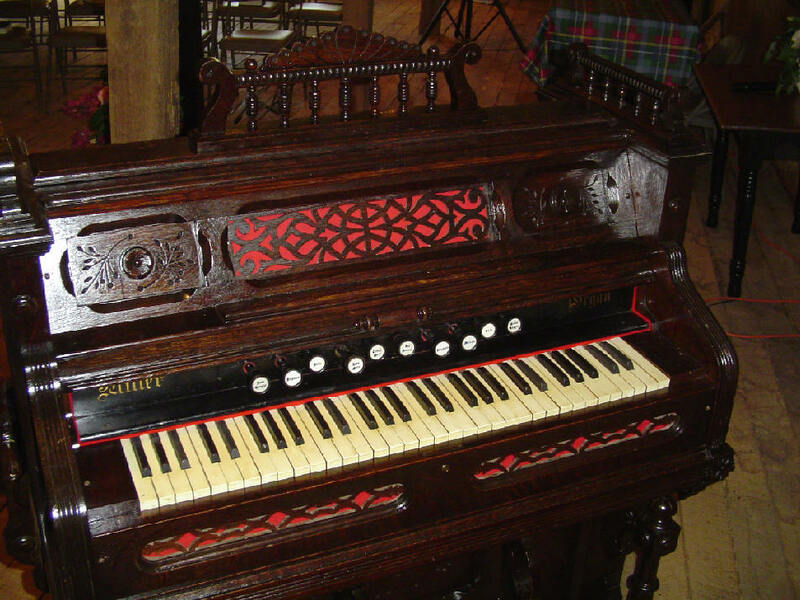 This organ was actually used during the war. It was built in 1851. In attendance were Generals Lee and Jackson. Here we are singing their favorite hymns -- How Firm a Foundation, and Show Pity, Lord (to the tune of the Doxology). Since our own unit could not make the event, I had the privilege of falling in with the 21st North Carolina Regiment for battle. Thanks, Rollo and Shane. You guys are great. What a hobby this is! Where else can a man run up and down hills wearing a wool uniform in 100 degree weather? 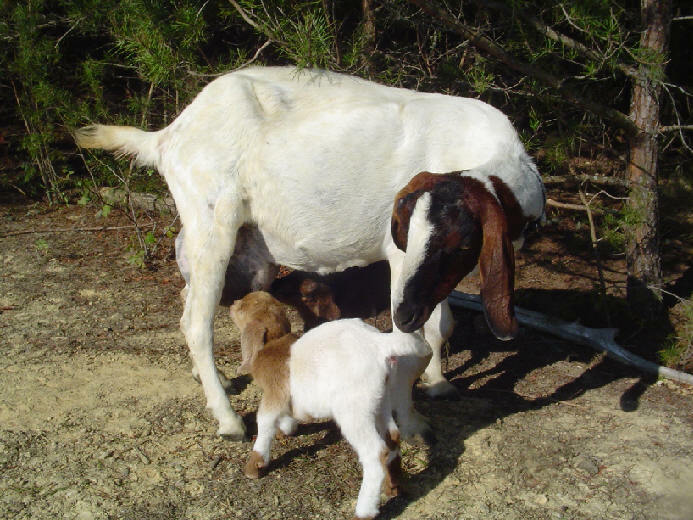 8:34 AM The latest baby goat names: Jasmine and Jasper. If I missed yours, please send it along. 8:25 AM Just got a sneak preview of Becky's new dress that she will be wearing this weekend. Wow -- it is incredible. Makes me want to live in the 1860s all the time. 8:13 AM Now this is really good news. For many years, readers have repeatedly asked me if I know of a church in this city or that city where they could hear the type of sermons that I regularly preach at Crossroad Baptist Church in Pensacola, Florida. While I know of hundreds, even thousands, of churches that preach the Gospel, I know of very few that are not either totally disconnected from cultural and political issues or little more than lackeys for President Bush. Furthermore, since virtually all of the national TV preachers are merely cheerleaders and lap dogs for President Bush in particular and the Republican Party in general, there is a great void and vacuum for independent, trenchant preaching. Accordingly, I would like to invite my readers to go to my web site where they can view and even download my sermons. My video sermons can be viewed by using either a dial-up or high speed modem. They can also be downloaded and saved on one's computer hard drive. I am linking to this article because I have nothing but the greatest respect for Chuck Baldwin as a man, a pastor, and a leader of the Black Robe Regiment. I had the privilege of hearing Dr. Baldwin's address when he accepted the vice-presidential nomination at the Constitution Party Convention in Valley Forge last year, and for many years I have followed his writings and have been listening to cassette messages that he was kind enough to send to Becky and me. I'll go out on a limb and predict that many of you who have never heard this man before will be spurred on to become even more patriotic Americans than you are today. For 29 years, on bright and cloudy days, you have brought me grace and beauty. I enjoy being a team with you. I cherish you with all my heart. Below: The rose and the thorn on their big day at Grace Bible Church, Dallas, Texas, September 11, 1976. 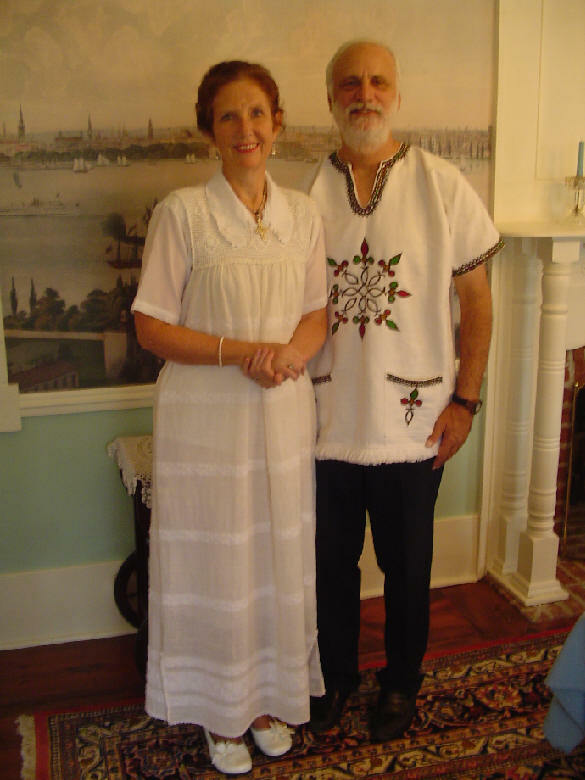 She is wearing a traditional Southern bridal gown, he a traditional Hawaiian outfit. From time to time I will share with you things that our Lord has impressed upon me over the years. This is because I am your mother and I care for you. The Ethiopian New Year is coming soon. (Did you know that the date of the New Year is also the date of our wedding anniversary? On Sept. 11 this year we will have been married 29 years. Much has happened in those 29 years!) As you think about the next year of the calendar, it is good to come before our Lord and recommit your life to Him, meditating on His purpose for you, and the life you have in Him. In all the celebration, make time to be alone with Him for a long period of time. He is the author of Time, and He has given you life at this period of time in the universe. 2) Live with nothing to hide. This means that we cannot manage ourselves and live successfully if we are always worried about the hidden things in our lives. We can’t run a race while looking over our shoulder, worried that some fault, some sin, some negative about us will be discovered and disqualify us from His purpose. There are two ways to live with nothing to hide. The first has to do with those things already passed; anything wrong in the past, no matter how terrible, can be covered by the blood of Calvary...all we have to do is bring it to the Cross. His blood is thicker than anything we have done, or are capable of doing. The Evil One wants us to remember and feel guilt; our Saviour wants us to remember and rejoice in His complete salvation. We have a hymn in English that goes like this “Calvary covers it all...my past with its sin and shame...my guilt and despair Jesus took on Him there. And Calvary covers it all.” When we bring the past wrongs to Calvary then we do not have to live trying to hide them; they have been erased by His blood, and we are free from guilt. The second way we live with nothing to hide is to maintain utmost integrity. This means we cannot separate our private lives from our public lives. All parts of our life is an open book to God; there are no secret parts. So we should be careful to have the same standard of behavior or thought life both when we are by ourselves and no one is watching, as when we are in front of everyone doing ministry. Know that you are loved this new year....by Him and by us! As the “secretary” of Bradford Hall, I want to give you an update on the preparations for our trip to Ethiopia. The reservations have been made: Dec 13 to Jan 17; the airfare is the same as last fall: cost is slightly less than $3,000. Dr. Black has posted the listing of project ministries that we have been appointed by Him. Many of you have written that you are praying with us; many have given us counsel and aid in areas (like computers!) where we are weak; many of you have sent funds or are gathering materials to send us. Just as He has appointed us and burdened us with this work, He has also appointed and burdened many of you. And it fills us with praise to see the way He builds His Kingdom through the giftedness and appointments of the various members of His body. Where one is weak, another is strong. No ministry, however small, is done in isolation. We are accountable to each other, under His appointment. So much is happening so quickly, and we want to share with you so you can praise Him with us! There are now a little over 13 weeks before we leave. We are taking every opportunity we are given to share with Family what our Father is doing with brothers & sisters in Ethiopia. And He is doing for others what He has done for us…giving a heart of love and concern for Ethiopia. It is so neat to see the interest, then love, then concern in people’s eyes as they hear about our loved ones in Alaba and Burji. The names of Bereket, Zemete, and Mohamed become real and familiar; tears are shed in companionship with the parents of murdered children. Love is borne of Him in hearts prepared by Him. Our Lord showed us a Toshiba laptop special…for only $700 we got a Satellite laptop with One Note & Works, a printer and a carrying case! (We ordered two and are trusting the money to be here by the time the VISA comes due.) One will go to an evangelist in Alaba, and one to an evangelist in Burji; we will give a computer class when we visit. Two new needs have come to our attention, and we believe these are also His appointment for us. The first is a need for living expenses for a student named Solomon Abebe. Solomon was one of the best students in Dr. Black’s Greek class last summer. He is the only believer in his family, and has suffered persecution for many years. Last year he came to Bible College without funding assistance. The College has given him a full tuition and books scholarship, but he needs $980 to cover his dorm room, food, medical and travel needs. If you can help, or know of someone who might help, let us know and we will send you more details, including his personal testimony. Dear Mama B. and Papa B.
Greetings in the name of Jesus Christ. Really I miss you!! How your ministry and job are going. We have been praying, so that you will be fruitful in your ministry and every activity and always praise God about having such Godly family. I have learned many things from your Christ minded life. Especially I have seen Christ in your life. Really this is a good model for any one who wants to serve Jesus in his full heart. Your servant hood life makes impact in my life. I wish more blessings of God to you. Also I appreciate your parentally concern up on us which you have done while you were in Ethiopia and after Ethiopia. I received all pictures and wonderful gifts from Fasil. Until you buy the blanket, I do not have it, but now I have a wonderful blanket. May God bless you!! The other gifts are also very wonderful. The neck tie with the picture of Jesus Cross which you have given me has been a wonderful tool to tell about Jesus Christ. Also the little Pillow which you (Mama) made is really wonderful. It is very interesting. Mama .B and Papa B. This is the good news which I have done in Alaba and other places. First of all the children in Alaba are memorizing the verses. Some of them are almost finished it and longing your coming. In both No.1 and No.2 KH churches I have trained 35 Sunday school teachers with certificate. It was very good. As we discussed they need more Sunday school materials. Also I have told them you will train them in coming December. They are happy to see you. Also I have preached in conference for more than 4000 people in Bonosha. It was very good. Nigussie and I have taught high school and college students about seven weeks. The other good news is we went my local area with Jesus film in that young church more than 400 people watched it and at that moment 38 Muslims converted. If it were big screen, it would have been better. Also my father entered the church for the first time and watched Jesus Film. After he watched the film he promised listening Christian songs and biblical messages in tapes. I am praying so that I may able to provide him a cassette player. As my brothers told me after we came to Alaba many people (Muslims) came to watch it. If I had a camera you would have seen it. We gave them a promise that we would return to them again. I think for future time this Lap top will help us more in our ministry. As I realized the warm feeling of the people there, I am very much interested to continue the ministry and discussed with brothers to enhance the film show evangelistic mission around the Muslim areas. I hope you would have the opportunity to attend one of such meetings with them when you come. Mammy, is it possible to get the other Lap Top for me, even the used one? If we can get it …Waw! Those 38 converted and other believers have been learning discipleship series. Please pray about that young church, which is surrounded by Muslims. The church is called Dada KHC. If God wills you may visit next time. You will see the amazing things which God is working in that area. Also my father and mother are very willing to meet with you. Please convey my warmest greetings to Lapsly and Nathan. Regarding the JESUS' film we have shown on the laptop, it was so amazing for us too. Even the number was more than 400 hundred. We have shown it in the church. This puts in my heart that we need to have larger screen so that people would watch easily and clearly from distance. As you have said it is good to have satellite laptop. We would give its responsibility to the Church elders and full time ministers so that they handle and use it properly and we also follow up its usage. So we are asking our Lord to give us a portable screen and a battery-powered projector. Already a mechanic has told us about using car batteries for power! A simple, light-weight projector & screen is about $1200-$1500. Our Lord has been SO GOOD to us in all of this! Even as we share with you this report and two new needs, we rejoice in His faithful provision of everything from strength to work, to direct communication thru email, to sharing opportunities, to the donation of funds and supplies, to the privilege of praising the One who is all in all! May you lift His Name with us is our prayer! 6:59 AM The latest addition to our home page is called What Time Is It? 200 B.C. : The beginnings of the Greek system of punctuation. Aristophanes of Byzantium, librarian of the Museum at Alexandria, invents the critical signs, marks of quantity, accents, breathings, and so on, still employed in Greek texts. 8th c. A.D.: Charlemagne’s Anglo-Saxon adviser Alcuin introduces the Carolingian minuscule script in Latin documents (the forerunners of our lowercase letters), along with the first evidence for a new system of punctuation. 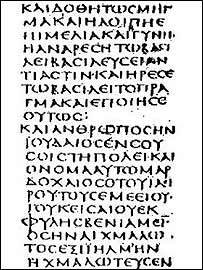 9th c.: The Greek punctuation system is supplemented by the Greek form of question mark (;). 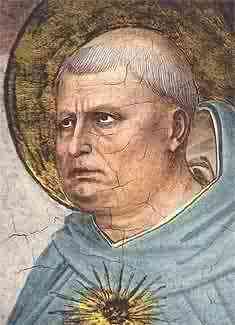 12th c.: Alcuin’s system reaches its perfection. Stops in the form of points or commas are joined by the mark later known as punctus elevatus (:) and by the question mark (punctus interrogativus), of much the same shape as the modern one but inclined to the right. The source of these two new marks was apparently the system of musical notation used for Gregorian chant. 16th c.: The basic form of the question mark (?) was developed in sixteenth-century England. Typographic historians contend that the design for the question mark was derived from an abbreviation of the Latin word quaestio (=what). At first this symbol consisted of a capital 'Q' atop a lowercase 'o'. Over time this early symbol simplified to the mark we use today. 17th c.: By the end of the century the various marks have received their modern names, and the exclamation mark, quotation marks, and the dash had been added to the system. Source. 6:42 AM The following names have been submitted for Lilly's new babies. You have until Sunday night to send in your suggestions. The winning names will be announced on Monday. 6:49 AM Every church faces major transitions from time to time, and these transitions can be opportunities to move toward reforming our principles and practices and conforming them more closely to the New Testament. It is interesting that I find so little written on this topic. Significantly, an essay at Founders offers some succinct but powerful observations of local church reformation. 6:45 AM I just noticed that over at Chafer Seminary they offered a course this summer in Linguistics for the Biblical Exegete. If I may put in my two drachma, I think courses like this are marvelous opportunities for students to see the relevance of linguistics for the study and application of Greek to teaching and preaching. It is simply amazing to see how Greek has such architectural precision, though this shouldn't surprise us -- God Himself designed the language. 6:42 AM Dayton College announces an opening in Greek. 6:48 AM Biblaridion has an interesting post on Greek handwriting. It's of interest to me because I well remember a course I took in the subject at the University of Basel in the early '80s. 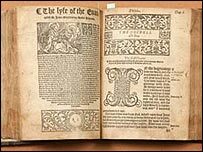 There were (I believe) a grand total of three of us in the class, but the reward for "enduring to the end" was the privilege of perusing Erasmus's original 1516 Greek New Testament. I know I've told this story many times before, but I hope it is a reminder that sometimes the most difficult courses produce the most surprising results. 6:40 AM I want to thank all of you kind people who read DBO and especially those who write to us. 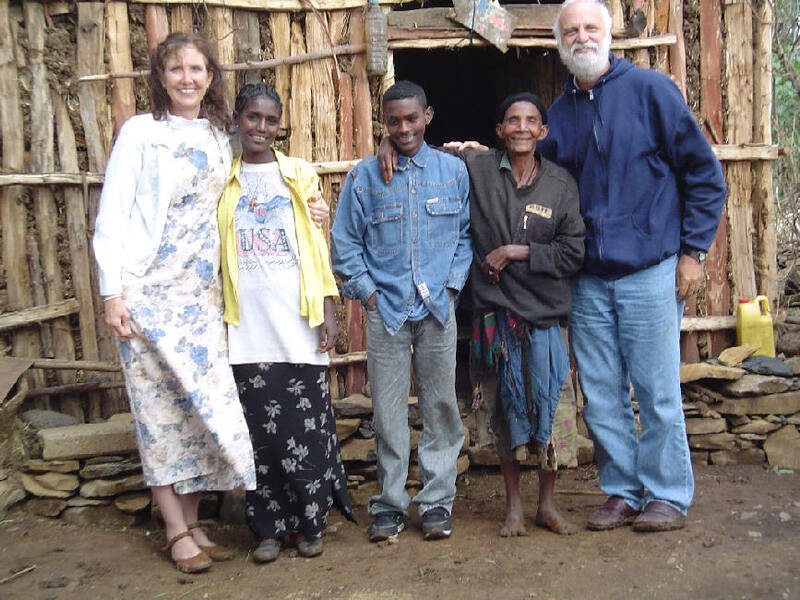 The Lord Jesus has put in many of your hearts a desire to help the work of God in Ethiopia, where the needs are so real and the opportunities so great. I hate to be redundant, but Becky and I cannot thank you enough. It really, really means a lot to us. 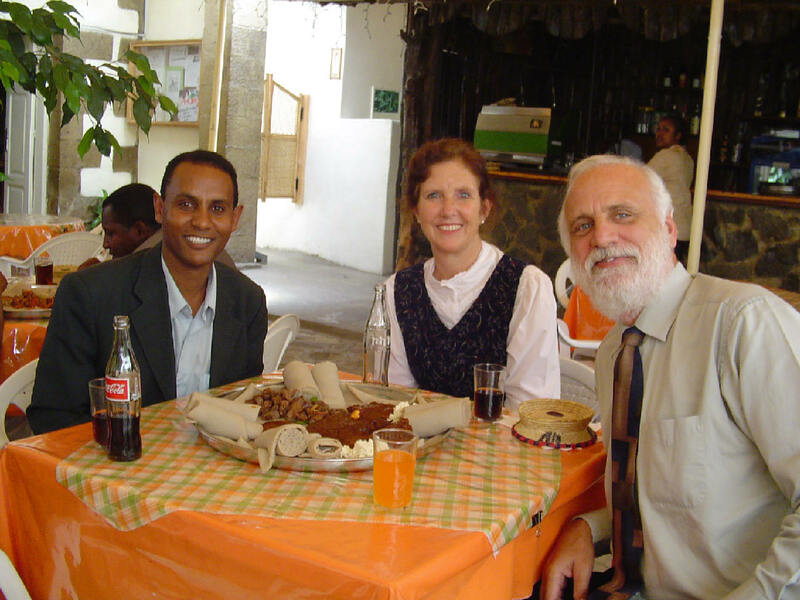 There have been many developments in our plans to serve the Lord in Ethiopia. We have decided that our December-January trip will be devoted to helping those who are the neediest and the most neglected by mission organizations and missionaries. We will spend much of our time working with the suffering church in the largely Muslim province of Alaba, where believers are literally paying with their lives for their faith in Jesus Christ. We will visit far-flung villages to encourage the persecuted and to share the Great News with the lost. 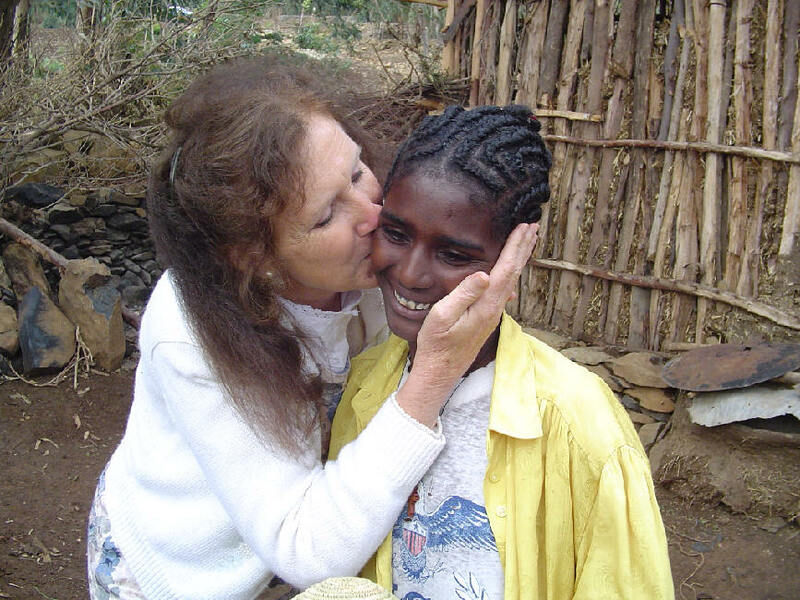 We will also devote our energies to assisting the churches in southern Ethiopia, particularly the towns and villages of the Burji district where Becky lived as a child. In all of this, we are “letting the dead bury their own dead,” as our Lord said (Luke 9:60). We must all have clear priorities; this is what Jesus is telling us. The call of God should have priority over everything else in our lives. Those who follow Jesus must be like that Good Samaritan who knew how to love his neighbor. Remember, the “neighbor” was not someone the Samaritan knew. He was not even someone of the same race. A neighbor is simply someone who needs help. The Gospels everywhere emphasize God’s love for the “unnoticed” – the Gentiles, the shepherds, the poor, the Samaritans, the lepers, the tax-collectors and sinners. Jesus notices the unnoticed and bids us do the same. Now, neither Becky nor I are professional evangelists. We work through no mission board. Neither of us has a degree in missiology. But in the New Testament, sharing the gospel was not only the task of the evangelists. Christians took personal responsibility for preaching the Word. We know, for example, that the church in Antioch was birthed and nurtured through individual households of believers sharing their faith. Becky and I are merely trying to use our Christian “household” in the same way. Evangelism belongs to the entire people of God. Well, you can see that we have a number of exciting ministry opportunities ahead of us. I know I have already mentioned this, but if any of you would like to help the Ethiopian church, here is a list of needs to consider. Remember, Becky and I fund our own expenses. Thus every penny you send will go to the ministry you designate. Meanwhile, please keep us in prayer, not only for Becky and me as we prepare to leave for Ethiopia, but also for our son who will have to manage a large farm in our absence. Thank you. We love you. 1:59 PM This just in: Meles to retain power in Ethiopia. 1:57 PM With gas prices so high, this idea is making better and better sense to me. Let's see, how long would it take me to get to Wake Forest? Speaking of horses, this was a dopey thing to do. 10:32 AM It appears that all the faculty, staff, and students at New Orleans Baptist Seminary are safe and sound. We can thank God for His mercy on the seminary and pray for His enablement as the school gets back on its feet. Meanwhile, please let Becky and me know if you are aware of someone stranded in Southside Virginia/Central North Carolina who needs a place to stay. 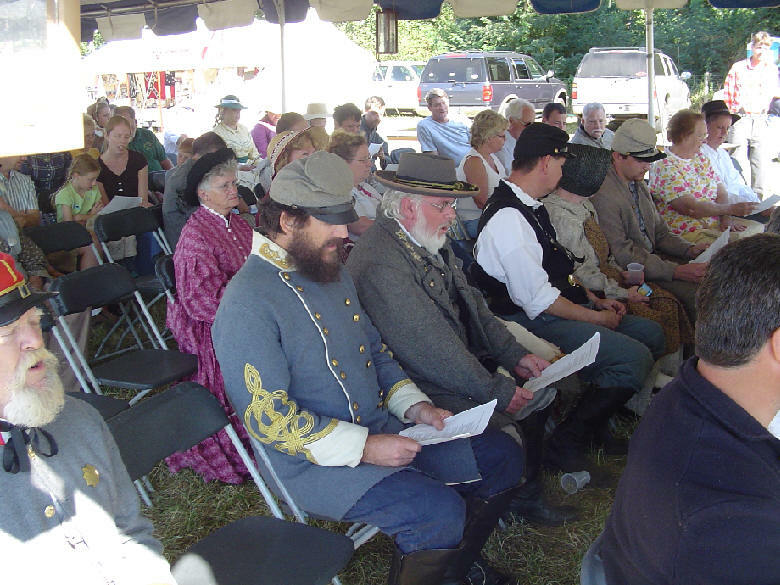 9:53 AM Just a reminder: this weekend is the Alamance Civil War reenactment. 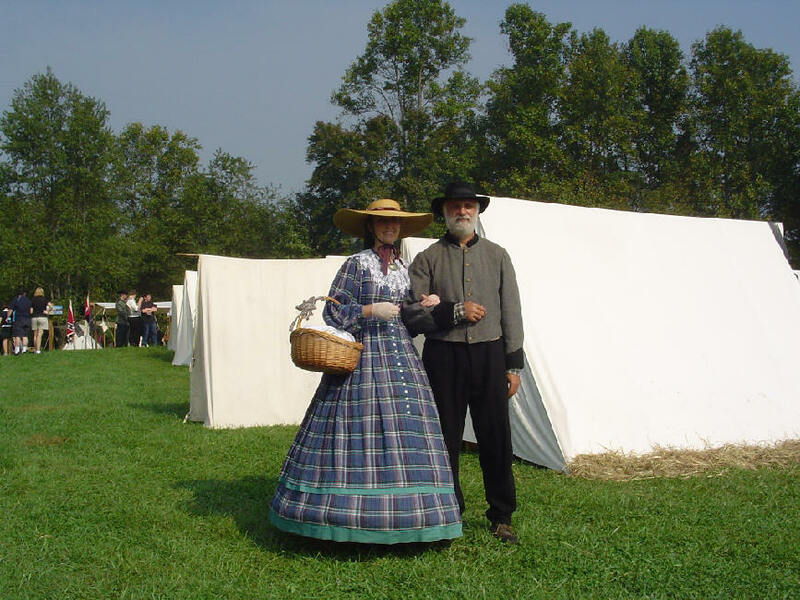 If you live in central North Carolina and have never seen an 1860s encampment or a battle scenario, this is living history at its best. Hope to see you there. 9:30 AM Can you feel it? There's a taste of fall in the air, and to help us welcome in the cooler weather Miss Lilly provided us with two new members of the Rosewood family on Saturday. 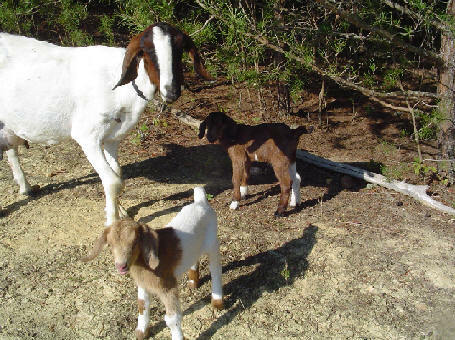 Would any of you boys and girls out there like to help Mrs. Black and me name our new babies? If so, have your mommy or daddy email us. 8:39 AM I have been reminding my students that just as it is necessary to exegete the Scriptures, so it is necessary to exegete the church fathers. Translations such as the Loeb Classical Series tend to be periphrastic and therefore unreliable. For this reason it is always a good idea to produce one's own translation from the original Latin or Greek. We must also pay careful attention to the literary context. If we don't we are liable to reach some very faulty conclusions. A classic example is Origen's famous statement on Hebrews: "But who wrote the epistle, in truth God knows." How many times has this statement been cited to support an agnostic view of the authorship of Hebrews? "Well, even the great Origen had no earthly idea who authored the letter, so how can anyone today have any greater certainty?" This is, of course, false humility. As I have shown elsewhere, Origen consistently cited the letter as the apostle Paul's. His statement was simply an admission that he did not know its penman (just as Paul authored Romans but Tertius wrote it). Why this misinterpretation is still perpetuated today escapes me, but it is living proof that few of us ever take the time to read let alone exegete the fathers. Exegesis means that we work with the original languages (ad fontes!) and interpret the words of an author within his own context or it means nothing at all. BTW, here's a great resource for anyone interested in studying the church fathers. 8:16 AM Muslims continue to aggressively evangelize Ethiopia. Their five-point plan is methodical and amply funded. The church of Jesus Christ needs to respond just as aggressively in love and forgiveness. My wife and I showed this slide yesterday during our talk at the Raleigh Chinese Christian Church. What do you say to a believer whose 8 year-old daughter has just been beheaded? A man who is so poor he cannot afford even to bury his precious offspring? I just hugged on him for about 10 minutes. Yet these persecuted Christians have forgiven their persecutors, and are remaining in their villages as testimonies to the love of Jesus for all men. By this we know love, because He laid down His life for us. And we also ought to lay down our lives for the brethren. But whoever has this world’s goods, and sees his brother in need, and shuts up his heart from him, how does the love of God abide in him? My little children, let us not love in word or in tongue, but in deed and in truth. As I mentioned previously, we have been in much prayer about our upcoming trip. Becky and I have decided to spend two weeks this December among the suffering in Alaba (where this photo was taken), going from village to village with a cup of cold water and a word of encouragement. We can't wait! 7:39 AM Although I have a great deal on my mind and heart, I will not be blogging today out of respect for the suffering, and in honor of those who are so sacrificially helping them. 7:08 PM I know you've heard it before, but I never tire of the view from my front porch. I took this photo three minutes ago. You can see that the pond is very low; in fact we haven't had any significant precipitation in months and desperately need rain. The farms are hurting something bad, and here at Rosewood our main crop is horse quality hay. Still, the Lord Jesus knows what we need, and He gave us one good cutting this summer already, for which we thank Him. 5:10 PM Happy Blogiversary, Mark. 4:57 PM Here's an entire website devoted to the study of the Pastoral Epistles. And here's one that previews forthcoming commentaries on the books of the Bible. 3:52 PM Just take a look at the popular gospel tracts of this generation. There’s no hint of Hell, no mention of Judgment Day, no use of God’s law to bring the knowledge of personal sin and the gospel is presented as a means of happiness instead of righteousness. No wonder today’s ‘new’ gospel won’t stick. People are coming to Christ for the wrong reason. They’re not coming to escape the wrath to come. Acts 17:30,31 tells us that God calls us to repent “because” He has appointed a day in which He will judge the world in righteousness. Read more. 3:45 PM Never stop praying. 9:45 AM Just received a special production report from the Austin egg farm on their "booty" from this morning. A picture is worth a thousand words, eh? 9:10 AM BIG Saturday shout out to Nathan who is working on an old house in Rocky Mount. 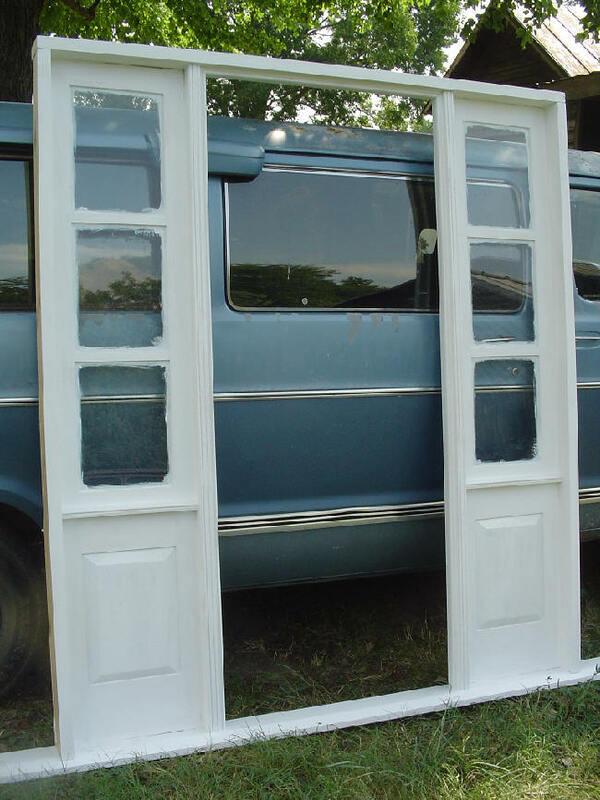 Here's the front door he made before he scraped the paint off the windows. Ain't it a beauty? Son, we miss you. Have a great time but hurry home! 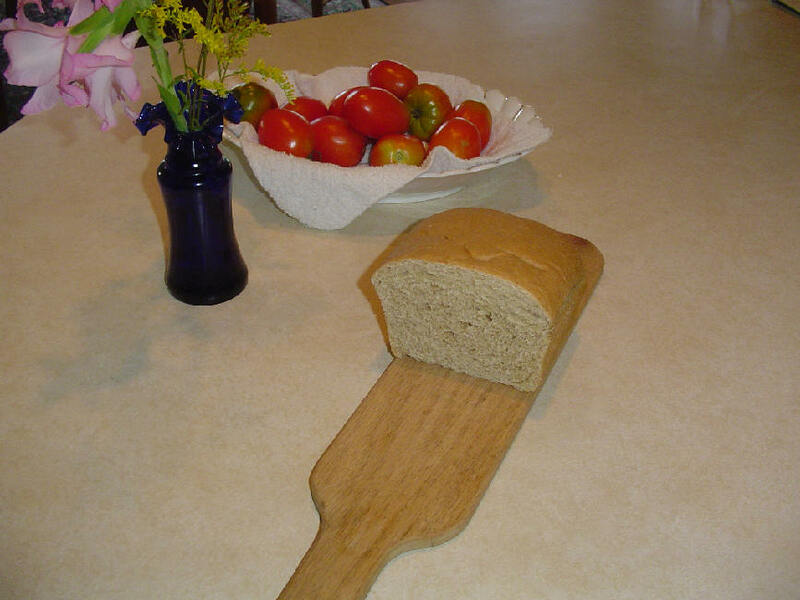 Our good friends the Meggs have been giving food and shelter to Nathan during his sojourn, and the Mrs. always sends back homemade bread for Becky and me to enjoy. This is a real treat. Thanks so very much! Then instruct my speech and touch my lips with graciousness. Make me keen to understand, quick to learn, able to remember; make me delicate to interpret and ready to speak. 7:40 AM I know it sounds sappy, but I really do enjoy doing ministry with Becky. In Matthew 10 we read that Jesus sent out His disciples two by two. Why 2 X 2? Having a partner provides courage, companionship, confidence, and just plain strength. Becky and I bring different but complementary gifts to our task. Working together as a couple has provided both synergy and energy. When I am weak she is strong, and vice versa. We help each other when one is down or ill. Most importantly, we hold each other accountable and keep each other from straying from our goals. Believe me, it is no fun being away from my wife, as during those last four weeks in Ethiopia when Becky was home canning our veggies (poor me!). So, my friends, let's work together as teams whenever we can, even as husbands and wives if possible. What say ye? 7:30 AM From the "O, Well" File: Yesterday I received one of my royalty checks. The grand total? Eleven dollars and thirteen cents. O, well. 7:24 AM I am trying to finish my book Unleashing the Church and at the same study (and perhaps comment upon) the emerging church phenom, including the black church. If you think there is a book or essay out there that is a must read, please email me. 8:30 PM Well, I began today's blog with a description of my morning routine, so why not end with a word about my evening one? 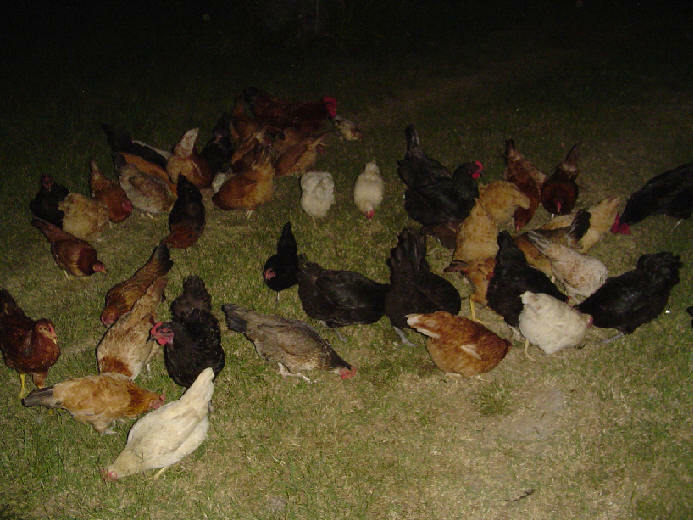 We let the chickens out of the coop in the late evening to free range, eat bugs and grass, and otherwise get some exercise. I stay there with the dogs to protect them from the numerous predators (foxes, possums, snakes, etc.) that seem to love our farm. 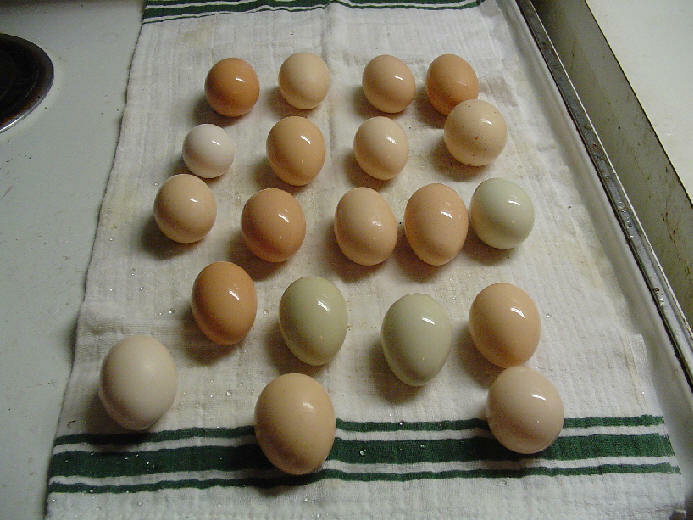 While the chickens are enjoying their freedom, I am collecting their eggs. 7:48 PM Wow, today's mailbag was full. I love getting your letters, especially when you overlook my many flaws! Here's an example. It is a response to our essay Shining in the Darkness. Dave, once again, great article except for the premillenial baggage!! I probablly couldn't shine your shoes as far as knowing scripture, but I know that the scriptures you referred to are all related to the first century church persecution, including: the judgement on the apostate jewish people and the destruction of jerusalem!! Remember the metaphors come from Ezekiel and were not unfamiliar to the people of that time!! But as far as judgement is concerned I totally agree with you!!!!! But I would look to Deuteronomy 28 and Leviticus 26 for answers to explain things today, instead of a last days end times scenario!! There is hope for improvement of the culture through obedience to God's Commands which affects ALL Of the Culture around us!!! Remember the condition of the culture is a reflection of the condition of the church and not the other way around!!! Thanks again for your excellent and inspiring articles. Hello and good morning (it's 8 am here in sunny AZ)! For what it's worth, I noticed that the download time was long right after your server was down. Before your server went down I never experienced a long download time, even with pictures, BIG, beautiful, glorious pictures....can you tell I'm a fan of the pictures you post? :) I'd wait for hours to see your pictures. See how kind people are to me? 6:37 PM There's a lot of practical wisdom in this essay by Mrs. Julie Austin of Parenting With Purpose. I would much rather stay here on the farm working (or riding my horse, for that matter) than travel. Yes, I enjoy preaching in various churches on the weekends and holding conferences out of state, and Becky and I would never think of giving up our missions trips to Ethiopia, but the days of our Wander-lust are definitely over. Nathan is the same way. There is just so much (healthy) work to do on the farm and there are so many ministry opportunities in our community that we actually have little time or energy to spend on less important things. Family meals, for example, are a non-negotiable at Rosewood Farm. I used to think it strange that so many of our neighbors had never been out of the county, let alone out of the state. Now I understand them perfectly! 6:17 PM I want everyone out there to know that our babies are adjusting very nicely to being out in the pasture with the big girls. 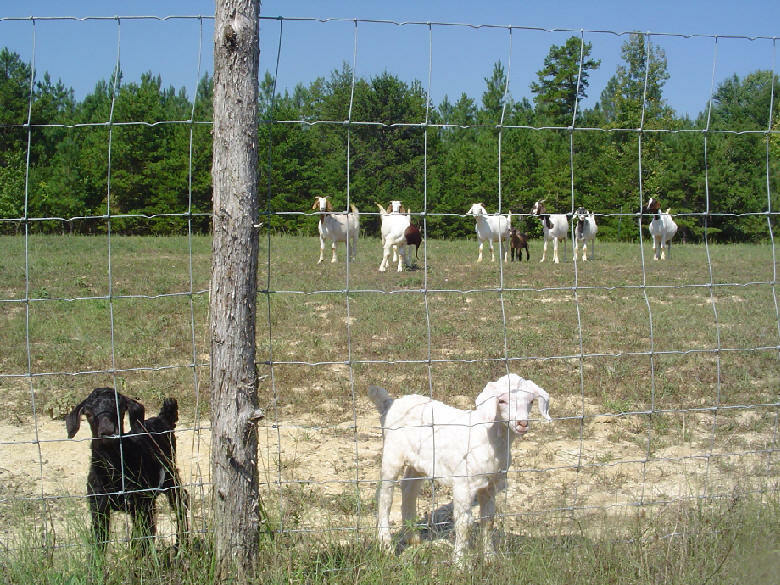 They romp and roam, cuddle and sleep, right along with the others. Of course, whenever they see daddy coming they still make a beeline to greet me (as in the picture below). Snowball and Midnight, I want you to know how proud I am of you. 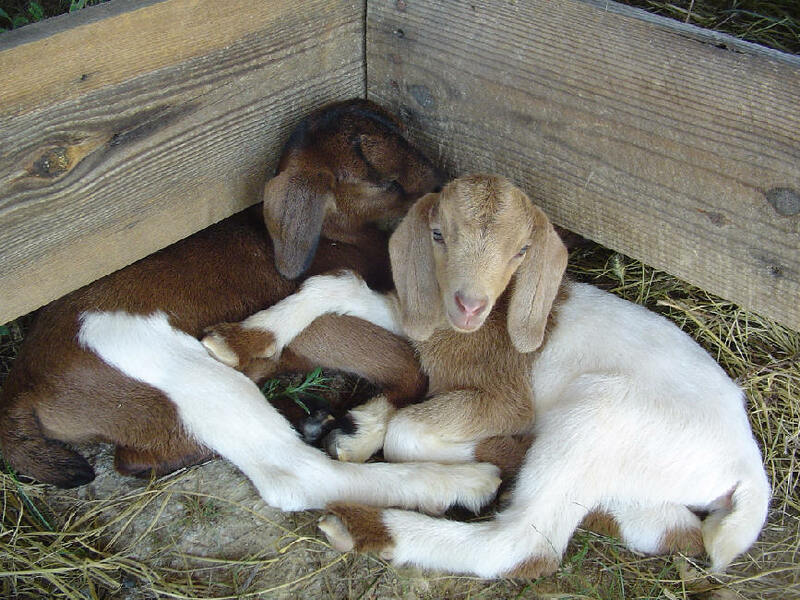 You are growing up to be such fine goats. We are very happy to have you in our herd. I only wish your mommy were still here to enjoy you. 9:45 AM Over at LRC, Pat Buchanan asks (and answers) the question of the hour: Who Lost New Orleans? 9:26 AM Here's one Texas wildflower who is doing what she can to help refugees from Louisiana. You are setting a great example for the rest of us, Lora. Every time you make a choice you are turning the central part of you, the part of you that chooses, into something a little different from what it was before. And taking your life as a whole, with all your innumerable choices, all your life long you are slowly turning this central thing either into a heavenly creature or into a hellish creature: either into a creature that is in harmony with God, and with other creatures, and with itself, or else into one that is in a state of war with and hatred with God, and with its fellow creatures, and with itself. To be the one kind of creature is heaven: that is, it is joy and peace and knowledge and power. To be the other means madness, horror, idiocy, rage, impotence, and eternal loneliness." 8:58 AM Young Caleb Hayden has written a thoughtful piece called Lifelong Obedience and Faithfulness from Youth. I hope that many young people will read it and then send Caleb an email response. Thanks, also, Caleb, for your kind review. 8:21 AM The latest addition to our home page is called Shining in the Darkness. It is written in honor of all those Baptists (and others) who are sacrificing their time and energy to bring relief to the suffering. (By the way, my son has asked to be on the next disaster relief crew going from Southside Virginia.) God bless them all. 8:19 AM In light of the terrible disaster in the Gulf Coast states, I thought this beautiful poem, The Beacon of Hope, well worth contemplating. the sailors shook with fear. no moon was out that night. the only source of light. the light to lead them home. the sailors asked and moaned. when his watching was in vain. he cried out in despair. the Lord was always there. gave hope to the captain's heart. the lighthouse beam would shine. the captain told his crew. the lighthouse beam shone through. the sailors clapped and cheered. for showing them His grace. a beacon full of hope. 8:12 AM I do not support the America Red Cross nor will I send them a check for disaster relief. They have become far too politically correct (i.e., cowardly). Here's but one example. 8:04 AM Our apologies for the long download time on our blog. I am working on reducing the number of pictures I post and also their size. However, I will still take advantage of the visual to complement the written word. Meanwhile, I wish all of you a very happy Friday morning. What a wonderful, hectic, relaxing, fast-paced morning it has already been for us here at the farm. After a wonderful time of meditating on Psalm 91 (is it by Moses, like its immediate predecessor? 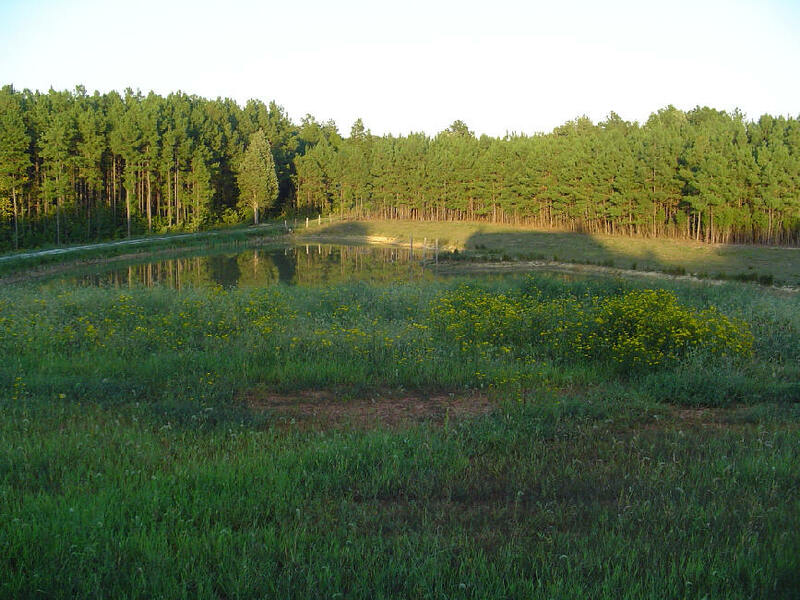 ), I sat on our front porch enjoying the most splendid view imaginable -- the pond and pastures and horse and cows grazing and birds singing and a distant donkey braying and goats sleepily waking up to begin their daily routine. My wife woke up and joined me for a cup of coffee. We both commented on the beautiful sunrise; it reminded us of Hawaii. (I told her that when I was growing up I would already be at beach surfing at about this same time. The air would be cool, and one would actually go into the water to warm up.) Then we brought our babies, Snowball and Midnight, to the porch where I bottle fed them. After they romped a bit we each took one in our arms and sat in our rockers as our "kids" went back to sleep. Then I took them to be with the grown-ups in the big pasture, fed the pregnant ladies their morning oats, took some oats to my horse (followed by the cows and Rusty, our billy), fed and watered the chickens down at my son's farm (he is currently restoring an old farmhouse elsewhere), took the doggies for their morning stretch, and finally sat down to update my blog. Aaah, the life of a Greek prof.
6:24 AM Happy September to all! 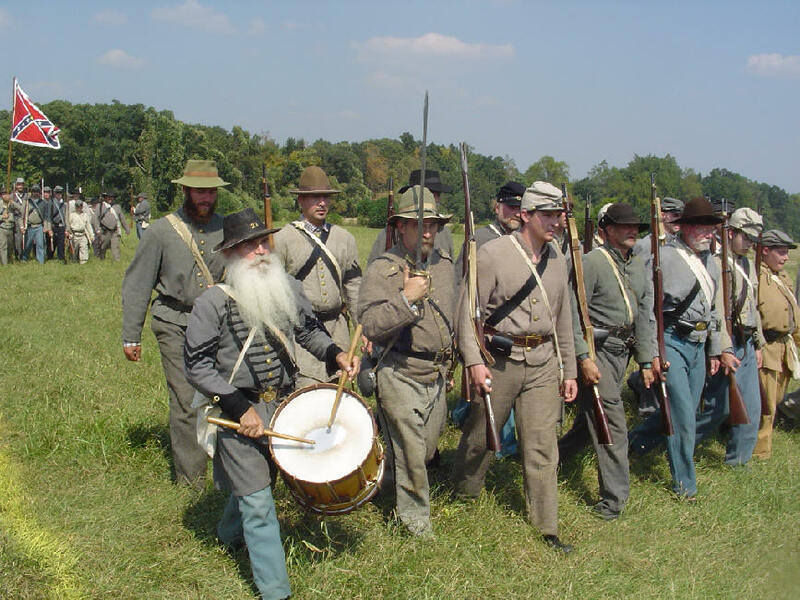 This month my wife and I will celebrate our anniversary on the 11th as well as participate in the first reenactment we've been to in months. 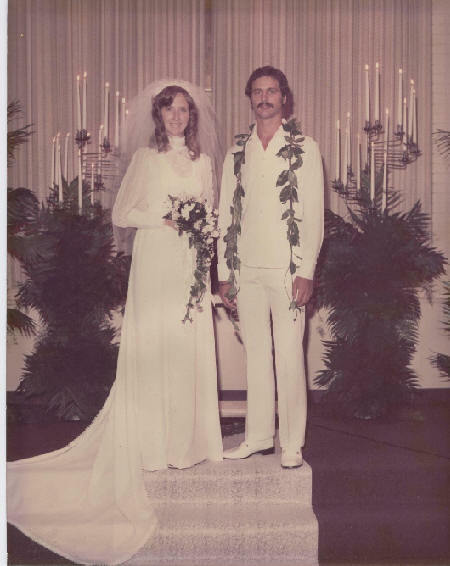 If you stop by the blog on our A-Day you might just see a photo of the girl from Gambo and the boy from Kailua taken 29 years ago in Dallas, Texas. To his bishop a rector once said/"May I take off my collar in bed? "/His bishop said, "No,/You may not do so,/You must wear it until you are dead." Which made this essay kind of funny. 6:15 AM If you live in or near Cary, North Carolina, Becky and I will be sharing photos and a report of our Ethiopian ministry this coming Sunday at the Raleigh Chinese Christian Church at their 11:15 English service. Directions may be found at the church's website. 6:12 AM Mentoring Men for the Ministry: Not too long ago I received an email that concluded with these cordial thoughts: "Since the Bible neither mentions the seminary, I shall look forward to hearing about your resignation." Well, the writer certainly has a point! We must always be willing to reexamine everything we do by the Scriptures and must always be seeking to conform our lives and practices more closely to the Bible. That includes those of us who have been training pastors for 29 years! Now a club can change presidents each year by election. But a church should never change pastors, because it is a family, and the pastor should be the father. Whoever heard of a family that changed fathers every other year, or of a father who ran off and left his family to take on another larger family? The father should be training his sons to take over the business. Thus it stands to reason that any young man wanting to learn about the Kingdom would turn to his pastor for instruction. Instead he leaves the church to go to Bible School, because the church is failing in it commission. I know of no seminary professor who would claim that the Bible School or seminary could ever train church leaders as effectively as a local church can. I would also note that not only have our churches failed in this function, but so have many of our seminaries. As long as we continue to imply that ministers are a special breed of sheep we are perpetuating the myth of the clergy-laity distinction. Let us recall that we are all ministers according to the New Testament, not just those who have seminary degrees. If our local churches really grasped this concept, the role of Bible Colleges and seminaries would be forced to change dramatically. We teachers would see our role as a complement to the work of local assemblies, and our "job description" would involve being shepherds and mentors rather than mere disseminators of information. Jesus trained His disciples by modeling, as did Paul (Acts 20:4). Thus I have begun to take on more and more young apprentices at the seminary and have brought them under my wing in a mentorship relationship, in an effort to supplement the apprenticeship model we find in the New Testament. Rob, I welcome you to the fold, and I look forward to our regular meetings. You join several others with whom I have the privilege of fellowshipping regularly for Bible reading, discussion, and prayer. I'm looking forward to it! 6:05 AM Austin's Parenting with Purpose is back with a bang, including a large selection of updates and new essays. Welcome back, John and Julie, and congratulations on your wedding anniversary!